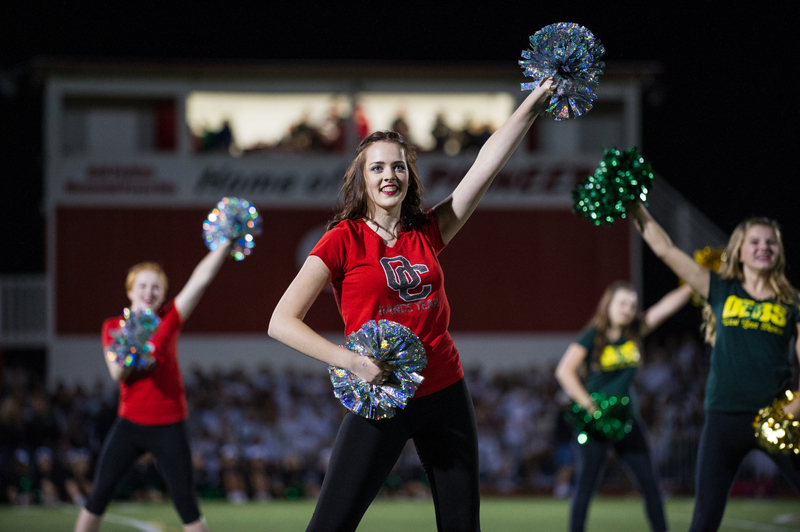 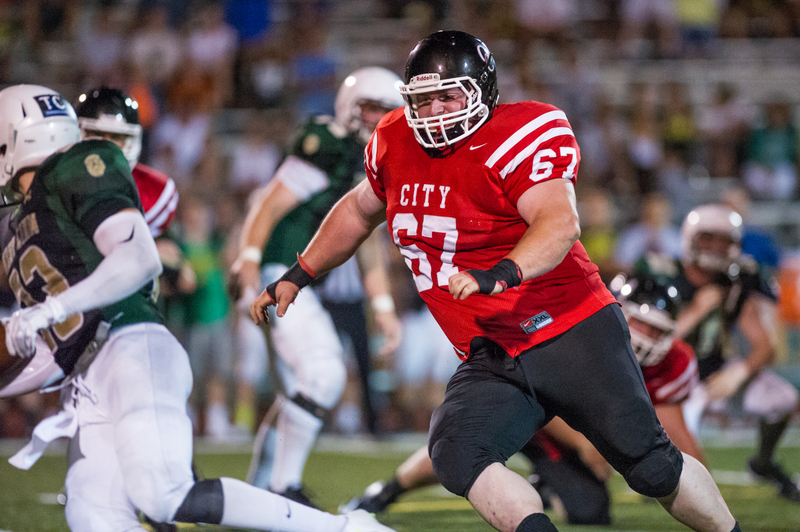 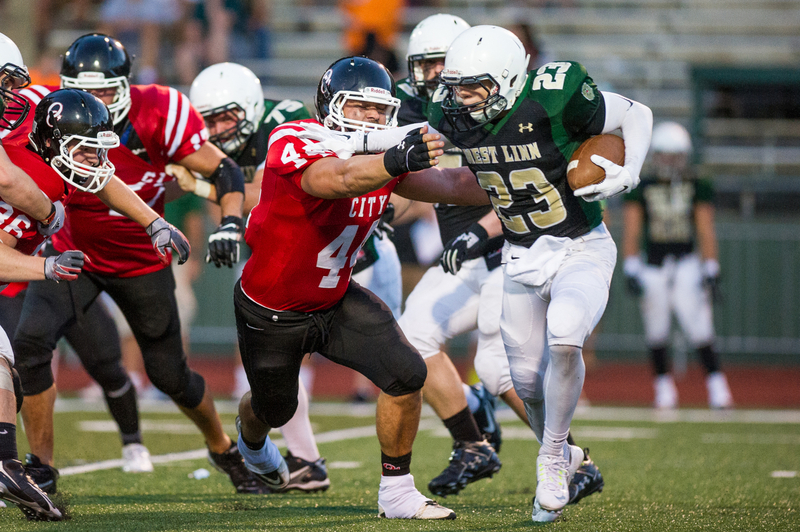 Just a few short weeks after the Oregon City alumni claimed rivalry honors over West Linn in the annual "Battle for the Bridge" football game at Lions' home field with a 48-28 victory, the 2015 OSAA 6A pre-season game between the two schools kicked off at Pioneer Stadium in Oregon City. 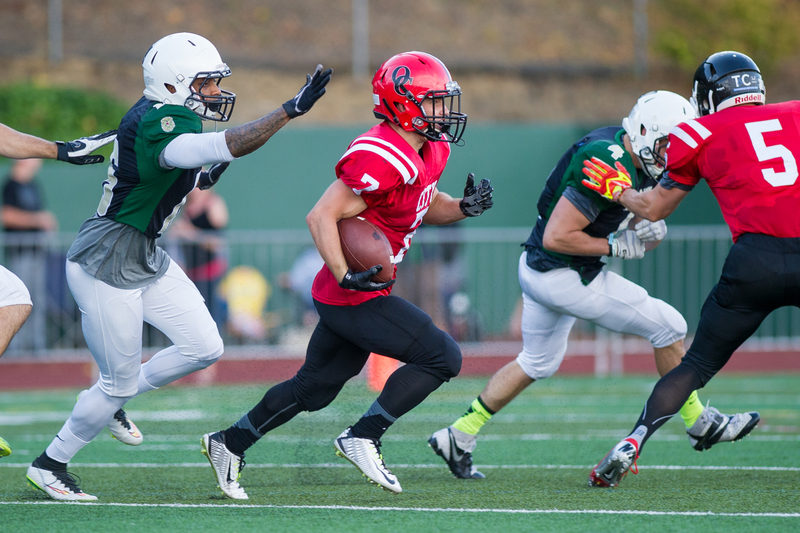 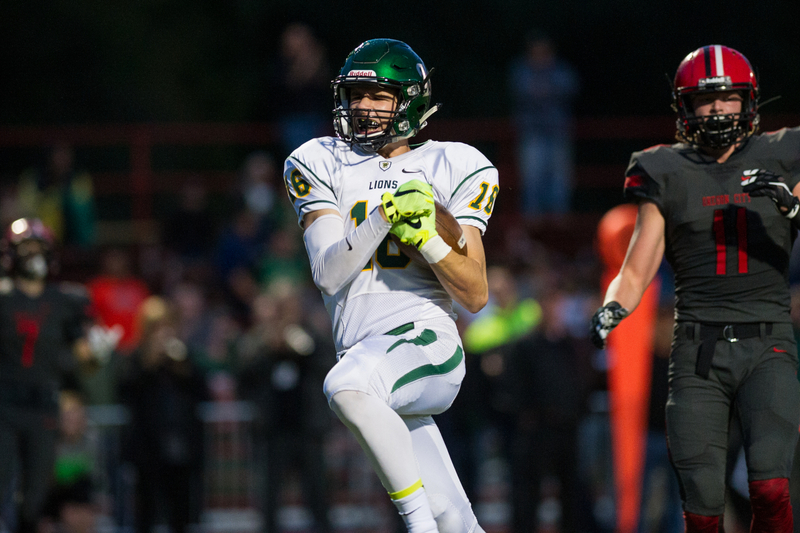 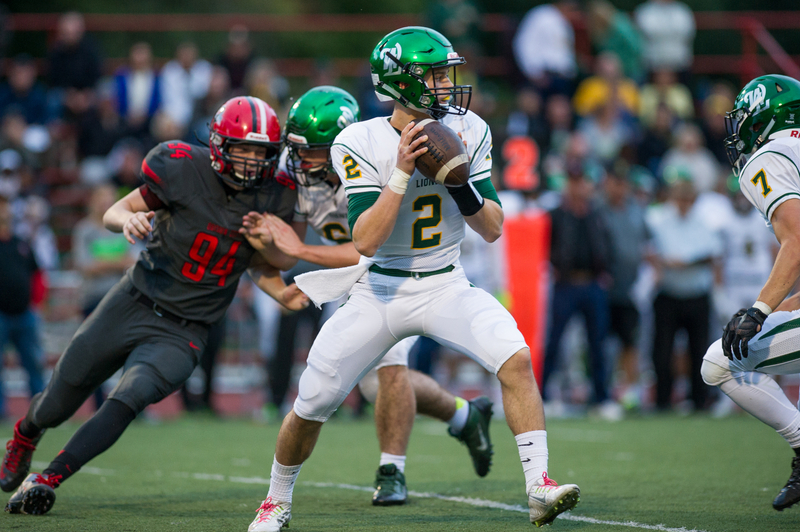 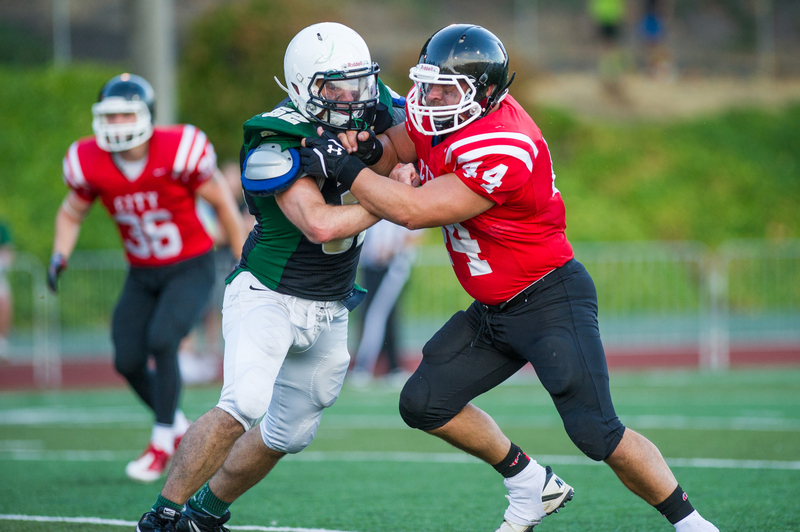 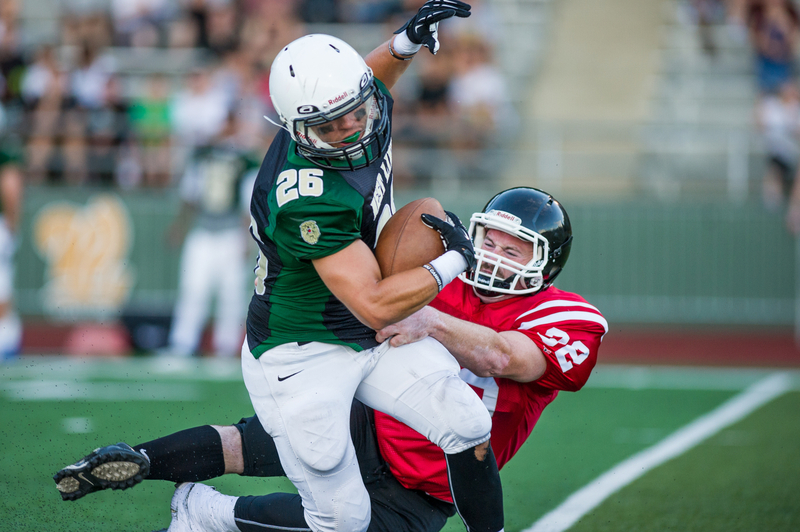 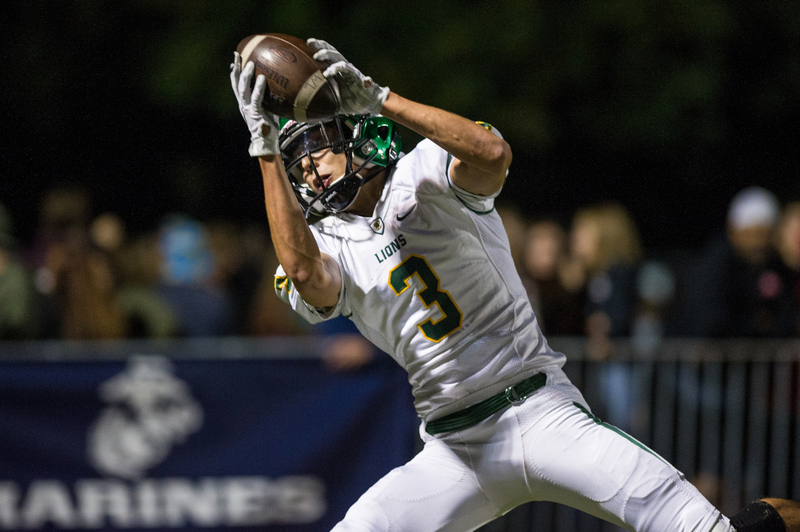 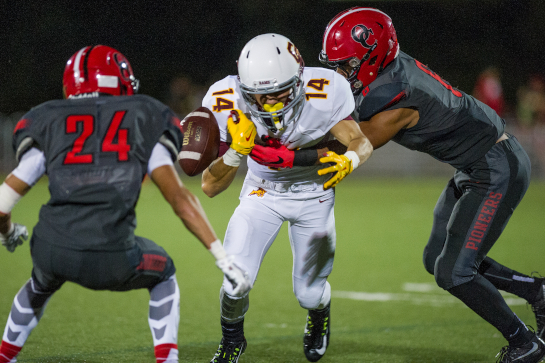 The West Linn Varsity squad took revenge on behalf of their alumni as their high octane passing game was too much for the Oregon City defense with the Lions cruising to a 40-28 win. 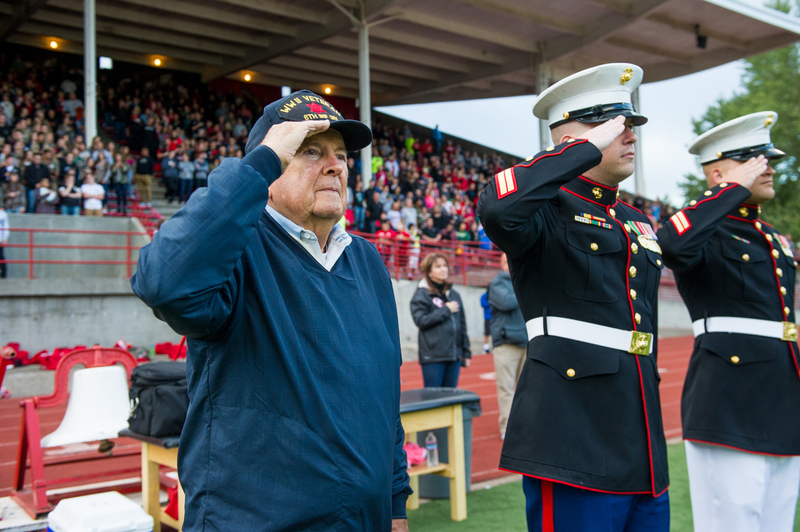 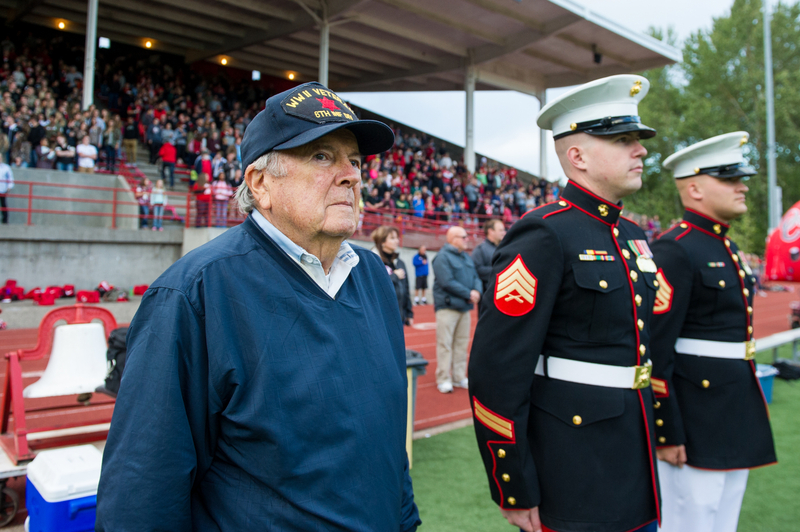 Oregon City alum and World War II veteran Hal Lindsley (left) was honored during the playing of the National Anthem before the start of the Battle for the Bridge rivalry game between Oregon City and West Linn at Pioneer Stadium in Oregon City. 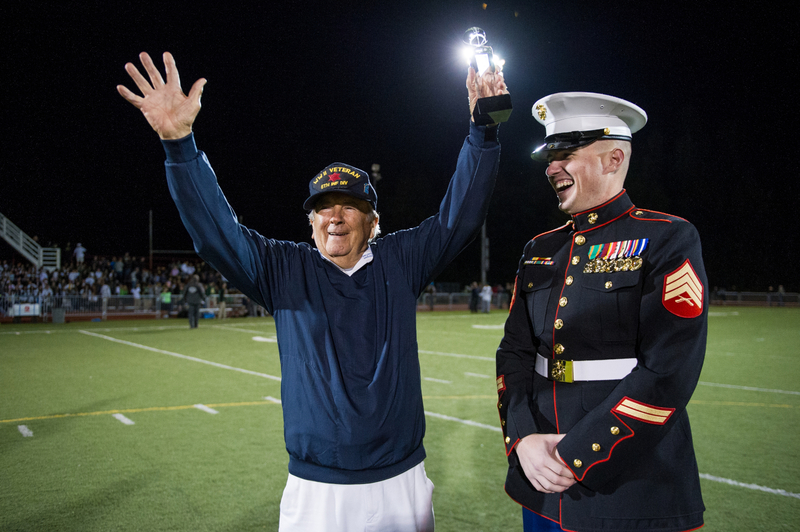 Lindsley played for the Pioneers during the 1945 Battle for the Bridge against West Linn. 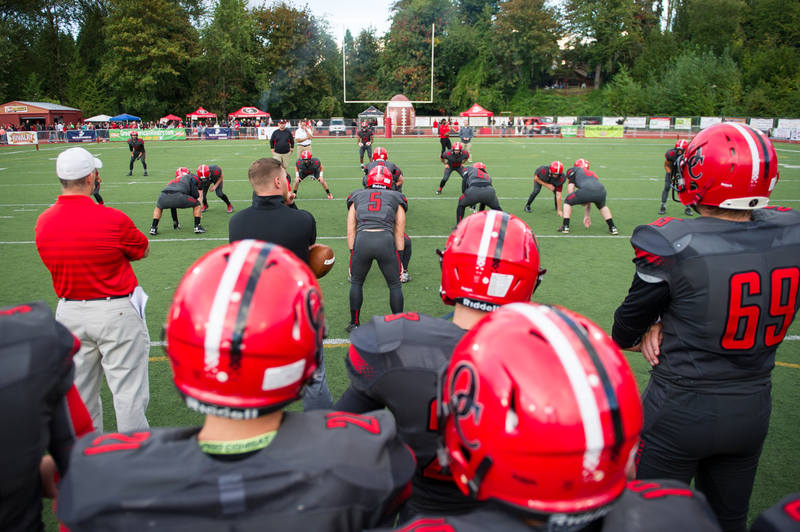 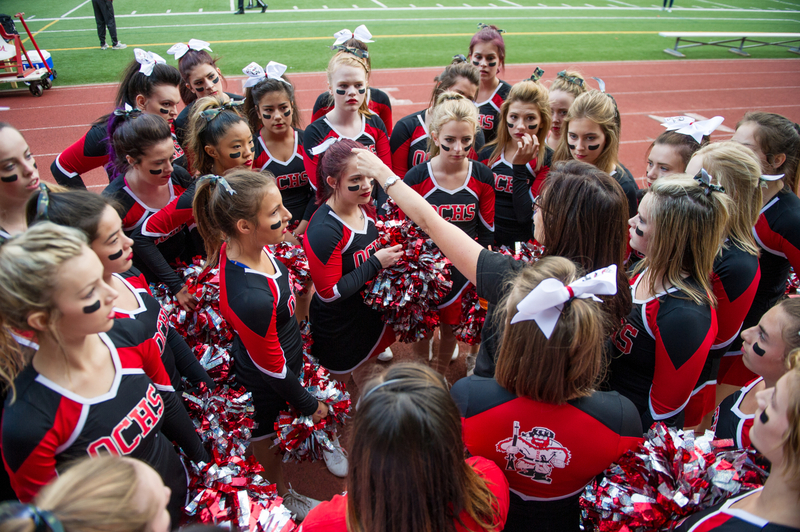 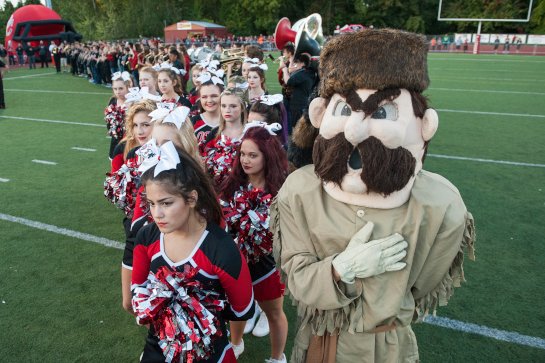 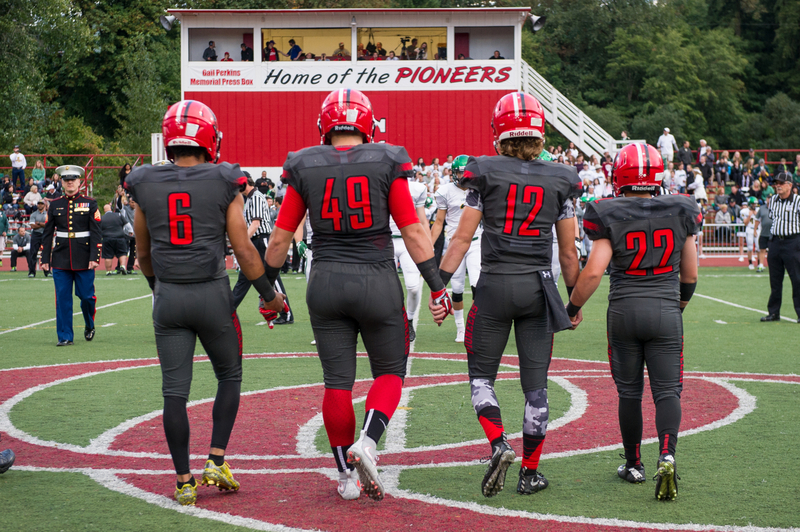 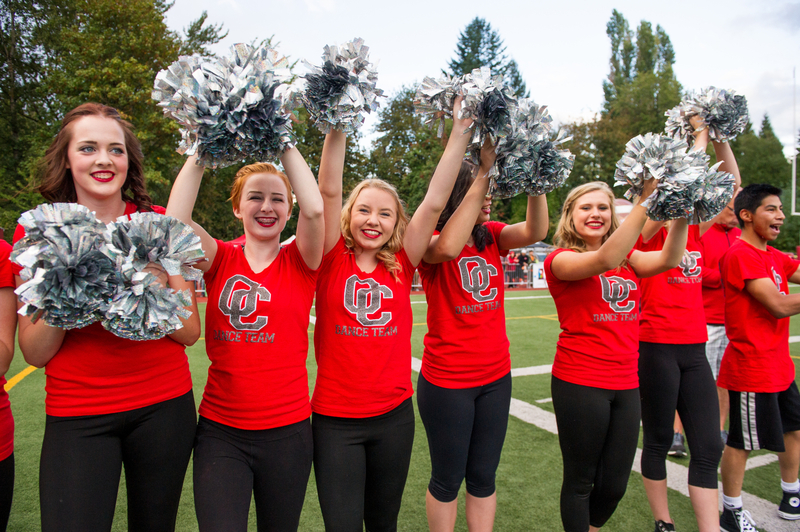 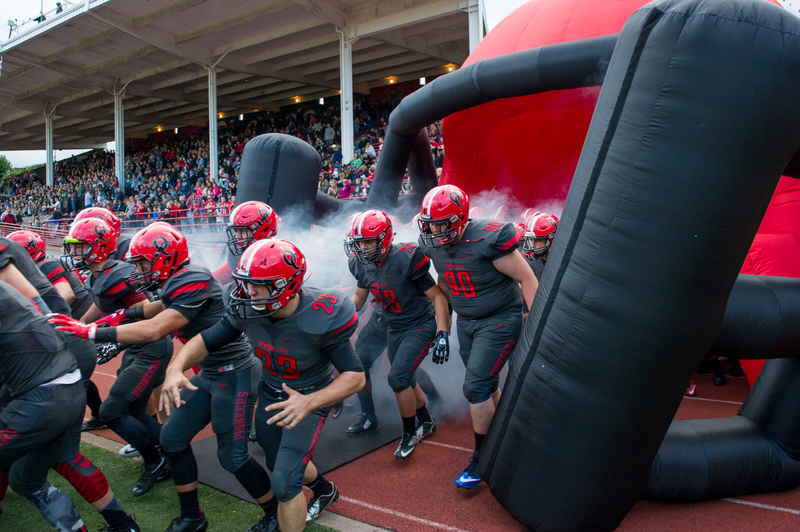 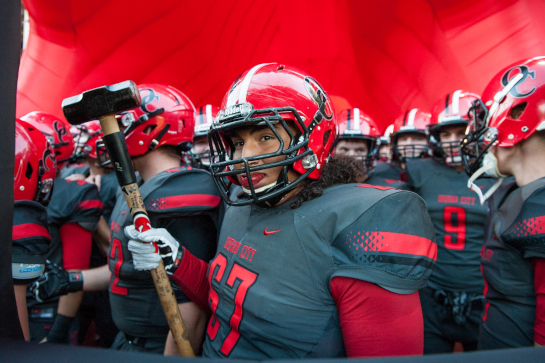 The Oregon City Pioneers take the field prior to the kickoff of the Battle for the Bridge against West Linn. 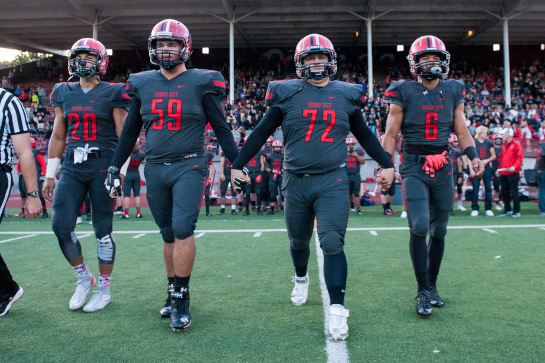 Oregon City captains Trevon Bradford (6), Tanner Smith (49), Riley Rexine (12) and Brayden Hirt (22) approach midfield to take part in the coin toss prior to the Battle for the Bridge against West Linn at Pioneer Stadium in Oregon City. 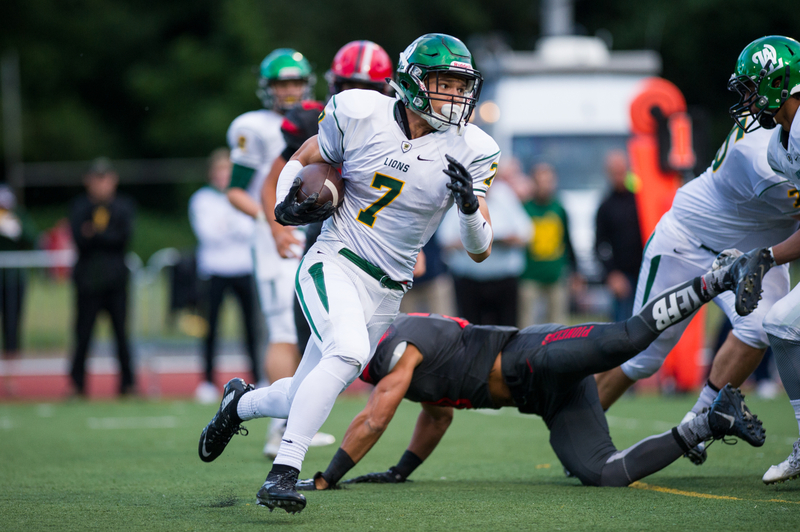 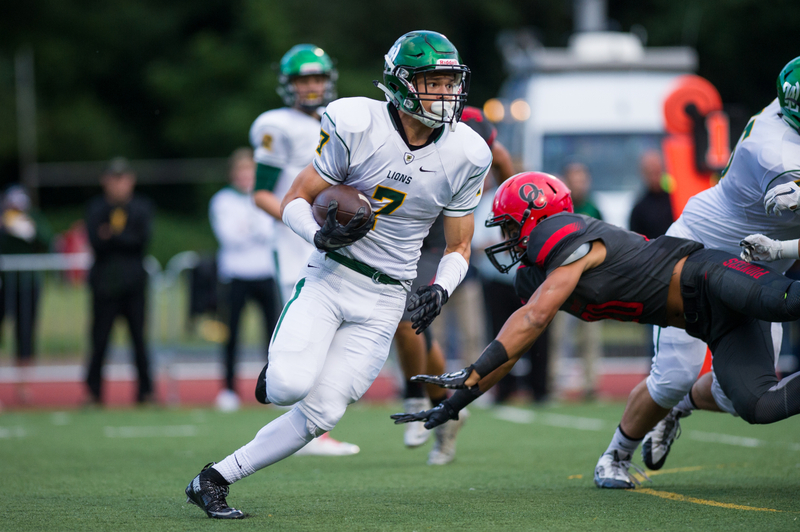 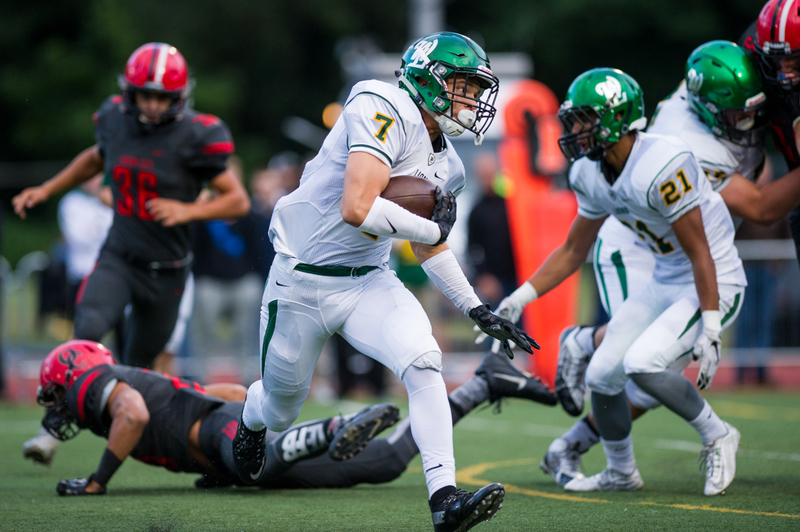 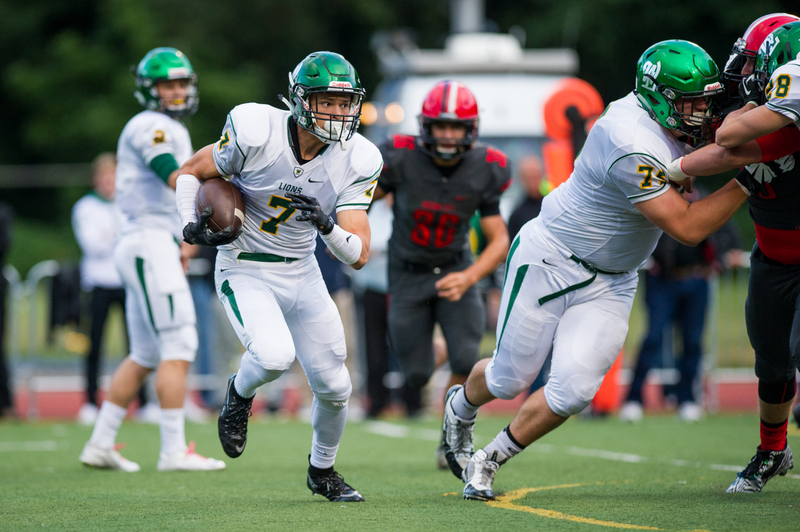 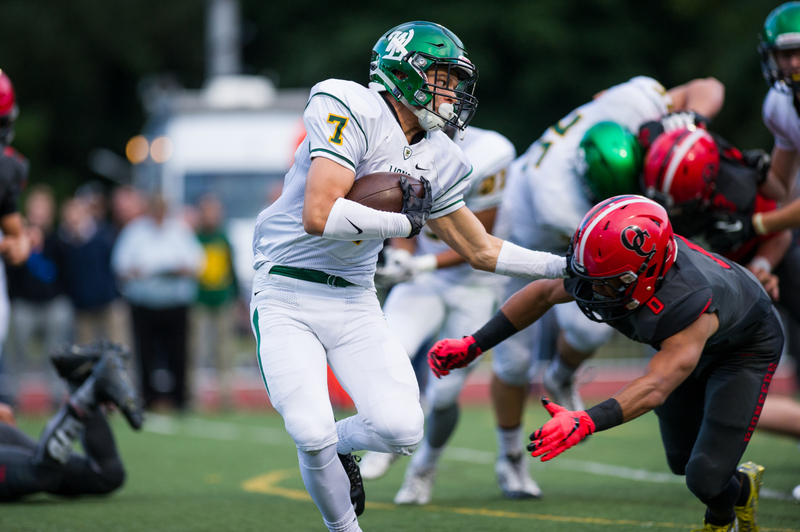 West Linn running back Elijah Molden (7) runs for a short gain during the first quarter of the Battle for the Bridge against Oregon City. 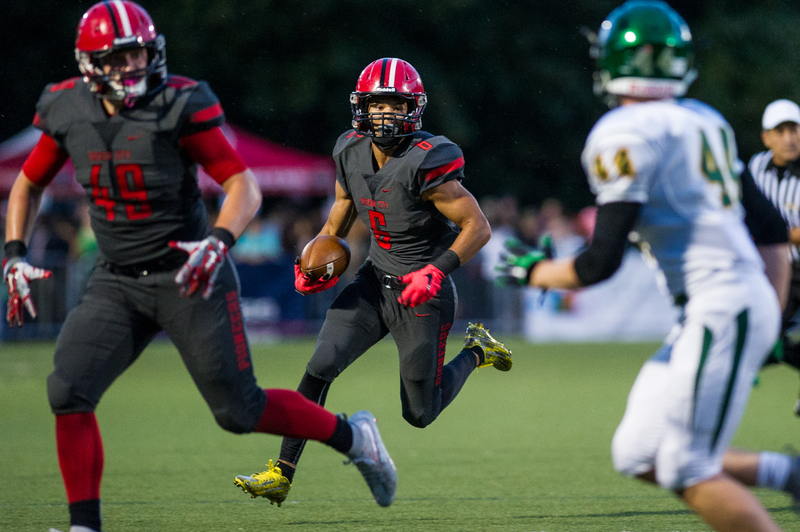 Oregon City running back Connor Mitchell (5) runs for a ten yard gain during the first quarter of the Battle for the Bridge against West Linn. 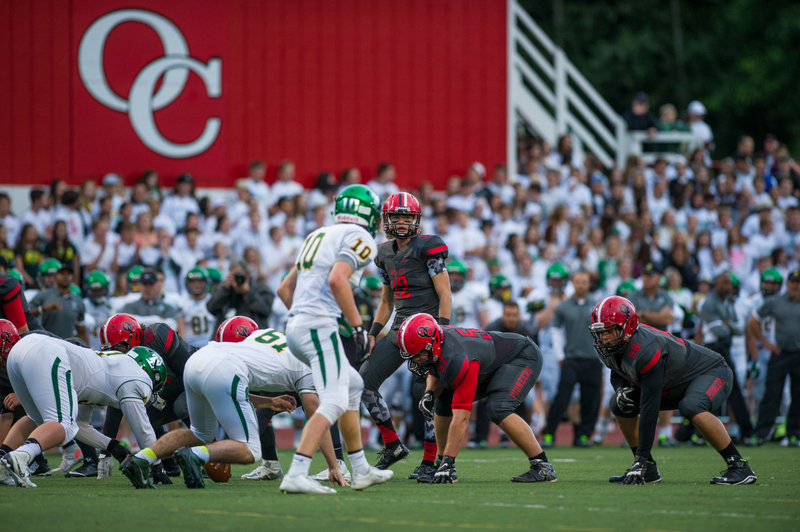 Oregon City linebackers Tanner Smith (49) and Kiahve Dennis-Lee (20) bring down West Linn running back Elijah Molden (7) at the line of scrimmage during the first quarter of the Battle of the Bridge against West Linn. 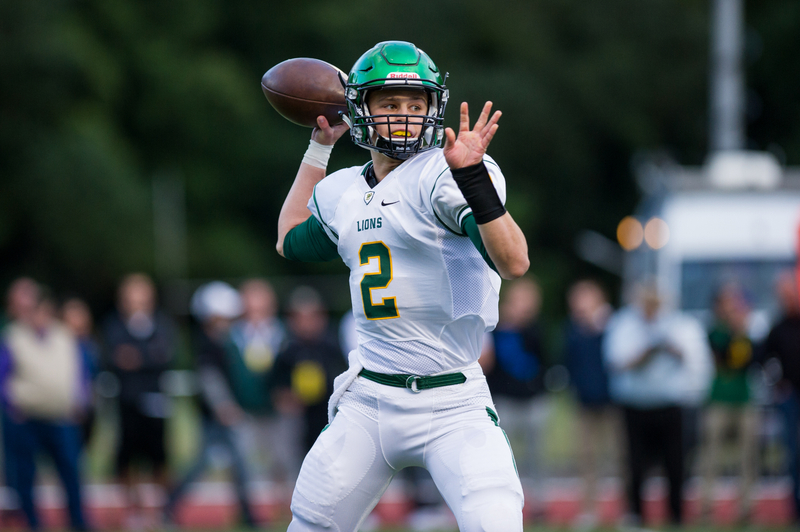 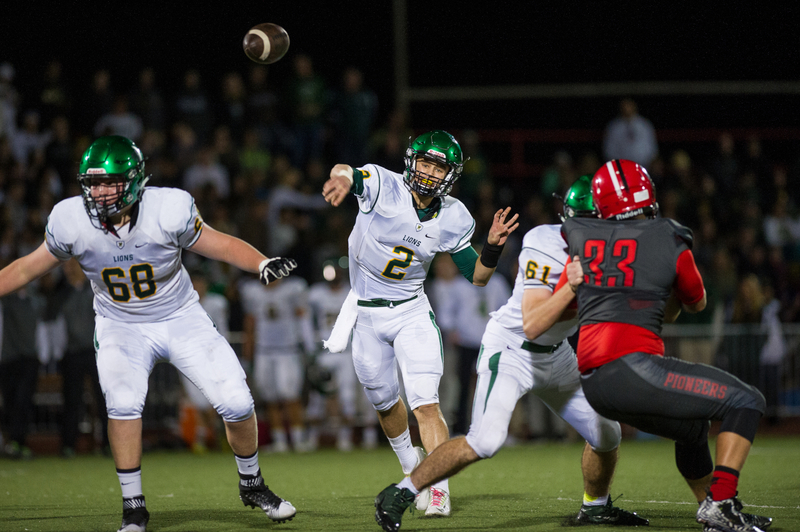 West Linn quarterback Tim Tawa (2) looks up field to pass during the first quarter of the "Battle for the Bridge" against Oregon City at Pioneer Stadium. 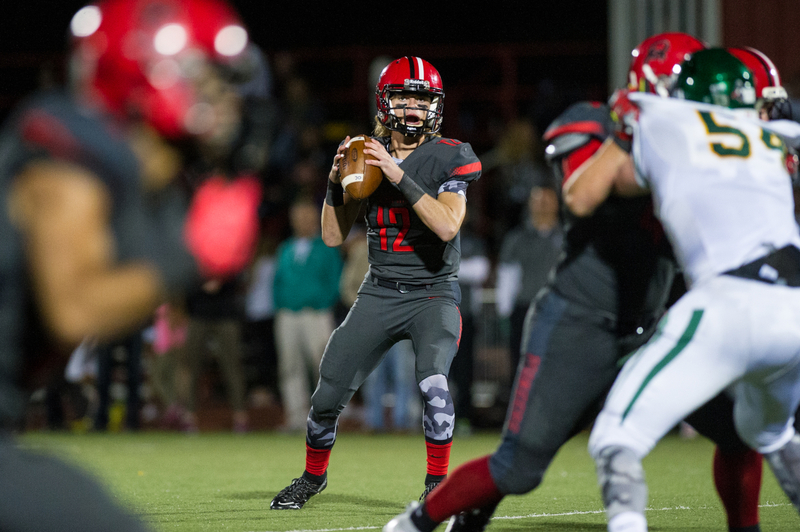 Oregon City quarterback Riley Rexine (12) looks to throw to wide receiver Sam Maughan during the second quarter of the Battle of the Bridge against West Linn. 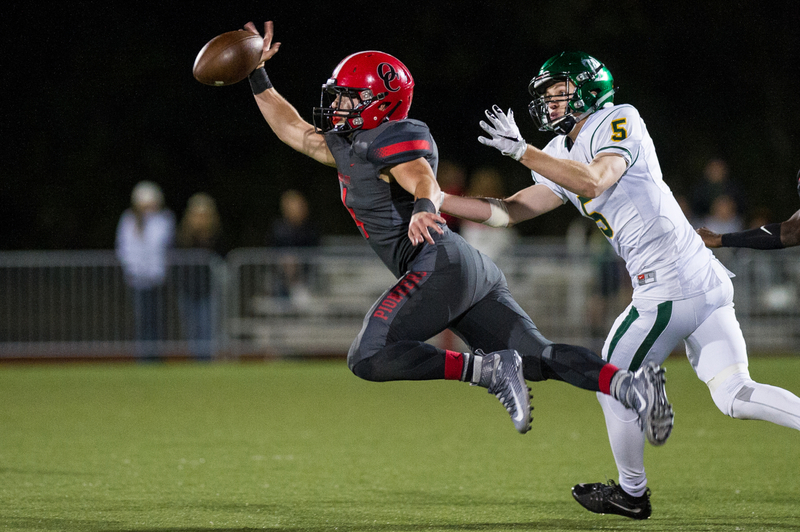 Oregon City running back Tanner Smith (49) gains five yards on a screen pass before being brought down by West Linn linebacker Jacob Taylorn (10) during the second quarter of the Battle for the Bridge at Pioneer Stadium in Oregon City. 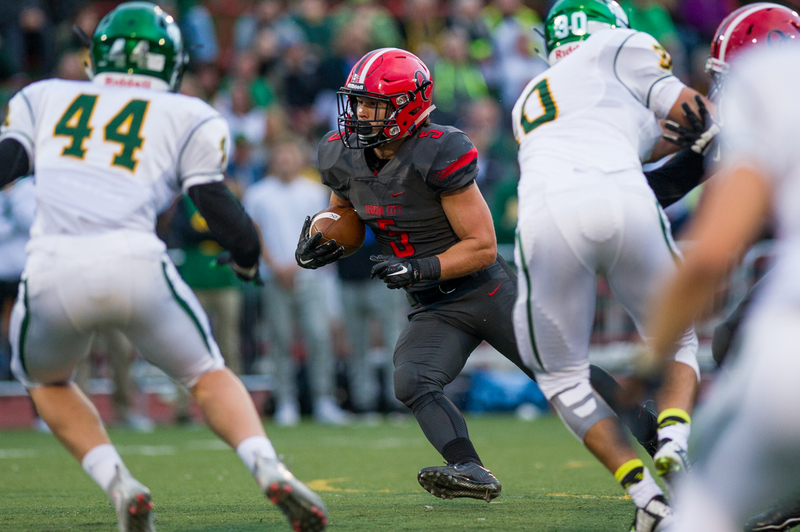 Oregon City running back Connor Mitchell (5) looks for an opening during a second quarter drive inside the West Linn five yard line. 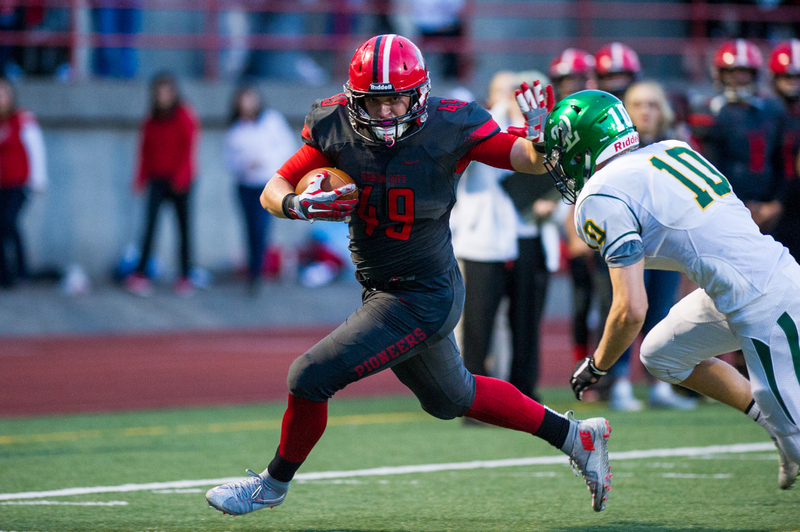 Oregon City wide receiver Trevon Bradford (6) runs for a 13 yard gain behind the blocking of Tanner Smith (49) during a second quarter drive into the red zone. 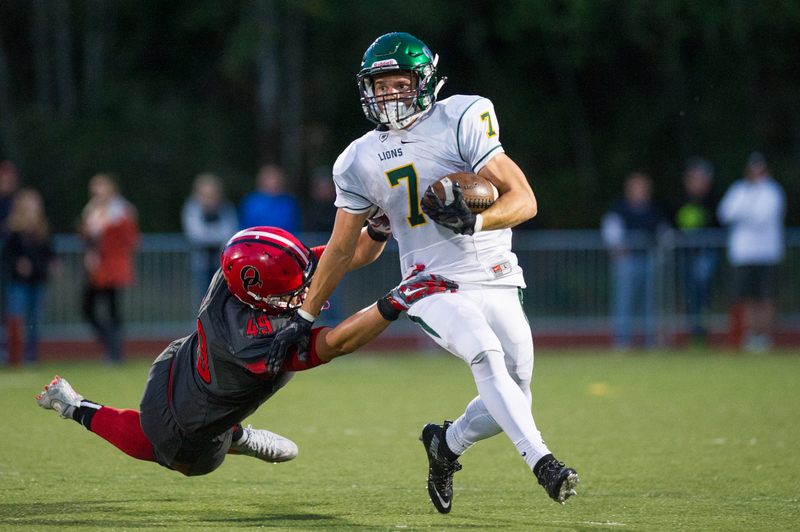 West Linn running back Elijah Molden (7) slips past the tackle attempt by Oregon City linebacker Tanner Smith (49) to go on for a 16 yard gain during a second quarter drive. 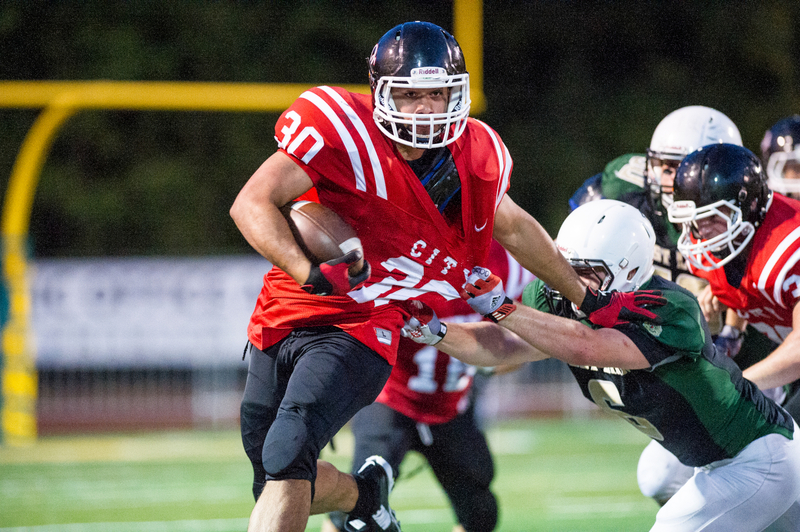 Oregon City running back Danny Tkach (23) runs for a 28 yard gain during a late second quarter drive. 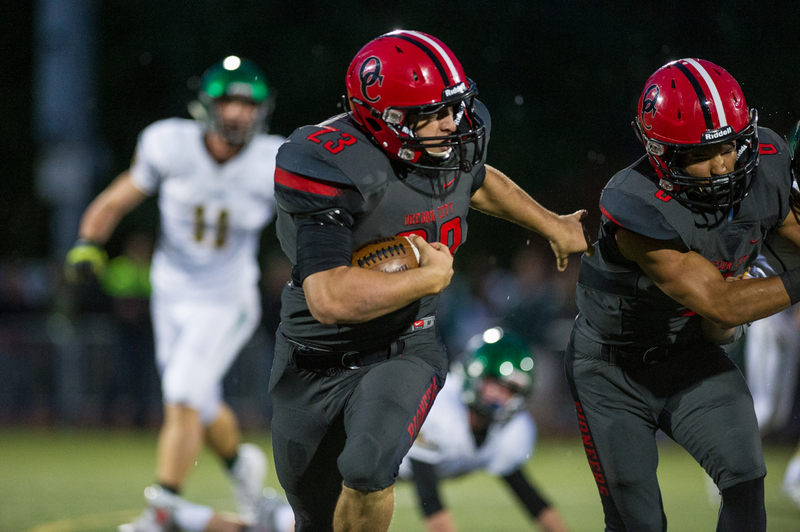 Oregon City running back Trevon Bradford (6) is caught in the backfield by West Linn linebacker Jacob Taylor (10) during a late second quarter drive. 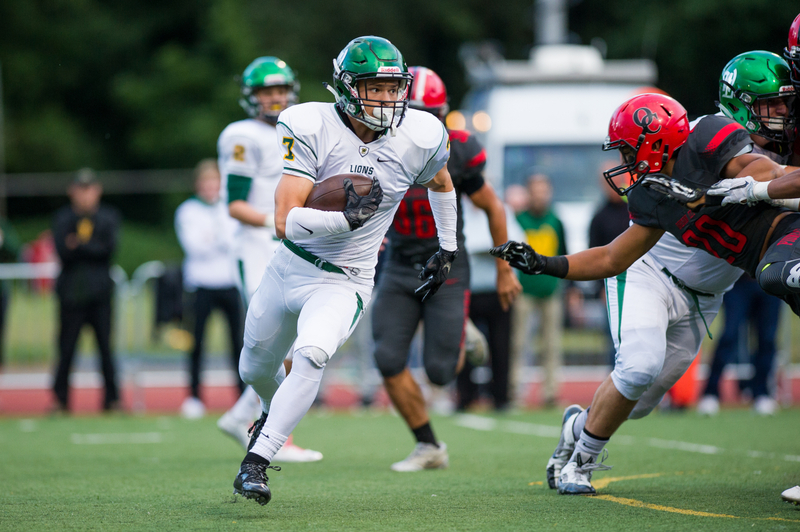 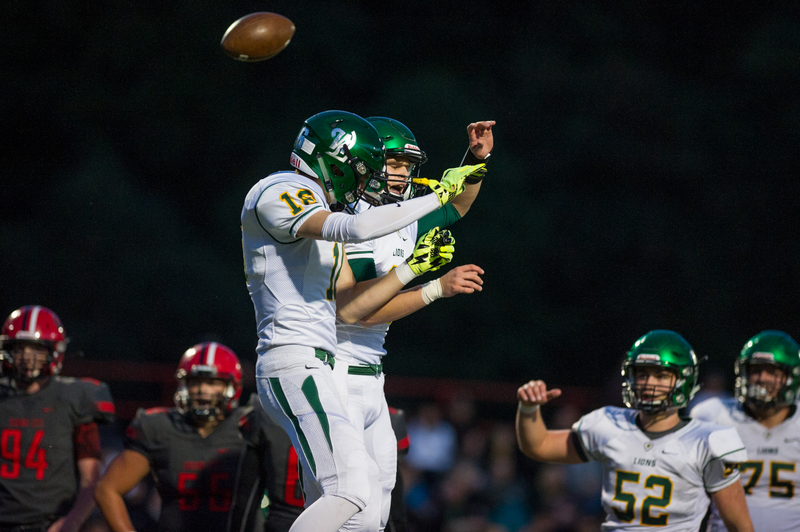 West Linn wide receiver Connor Berggren (3) pulls down a pass in the endzone for a six yard touchdown with seven seconds left in the second quarter during the Battle for the Bridge against Oregon City at Pioneer Stadium. 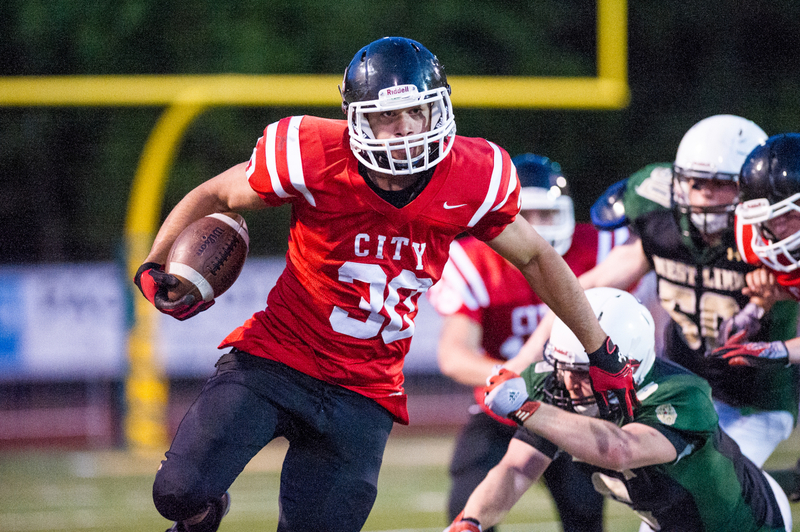 Oregon City running back Danny Tkach (23) runs for a short gian during a third quarter drive. 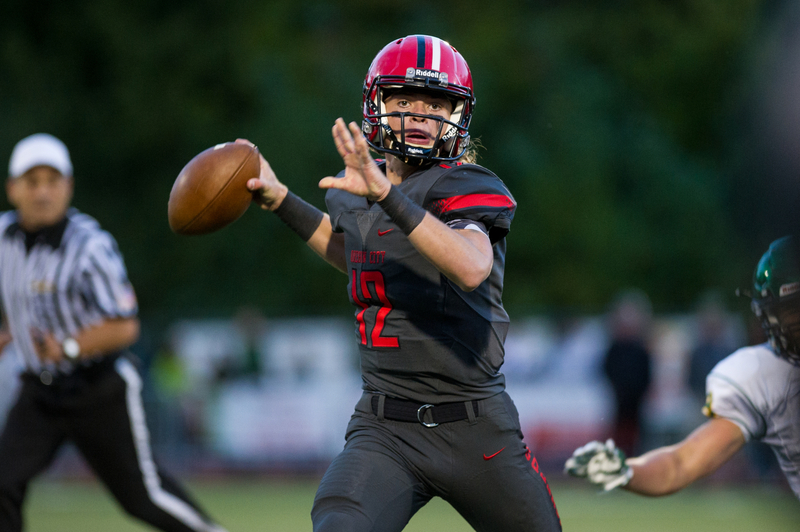 Oregon City quarterback Riley Rexine (12) sets for a pass during a third quarter drive of the Battle for the Bridge against West Linn. 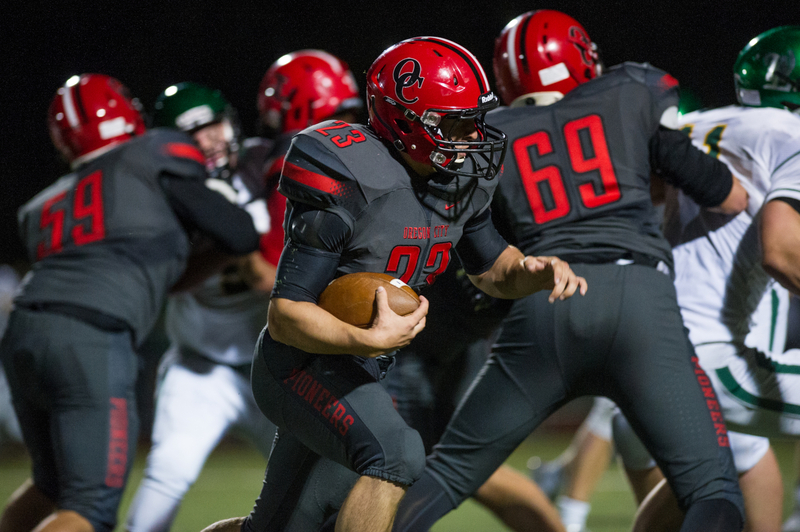 Oregon City quarterback Riley Rexine (12) directs his blockers as he runs out of the pocket during a third quarter drive of the Battle for the Bridge against West Linn. 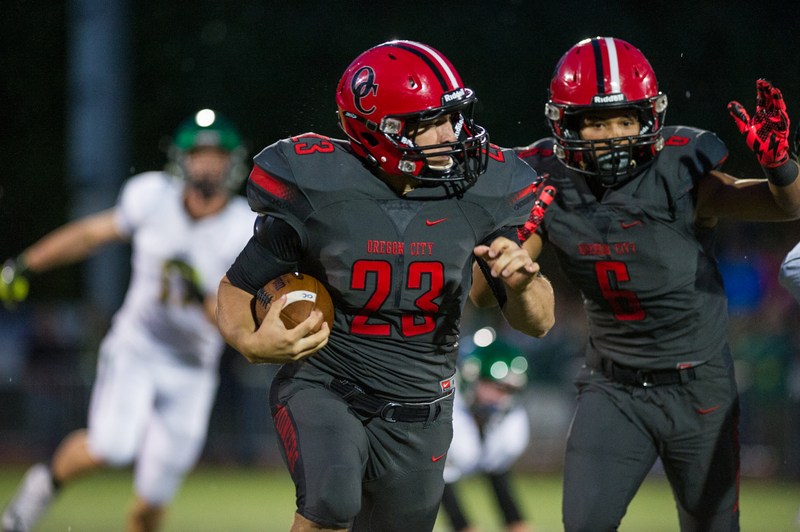 Oregon City running back Danny Tkach (23) takes the hand0ff from quarterback Dequahn Dennis-Lee and goes on for an eight yard touchdown with 5:33 left to go in the third quarter. 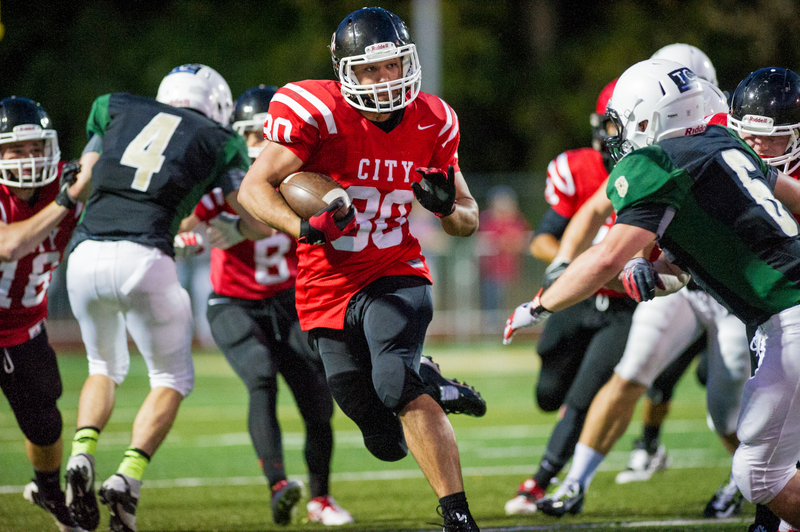 Oregon City running back Danny Tkach (23) runs for an eight yard touchdown with 5:33 left to go in the third quarter. 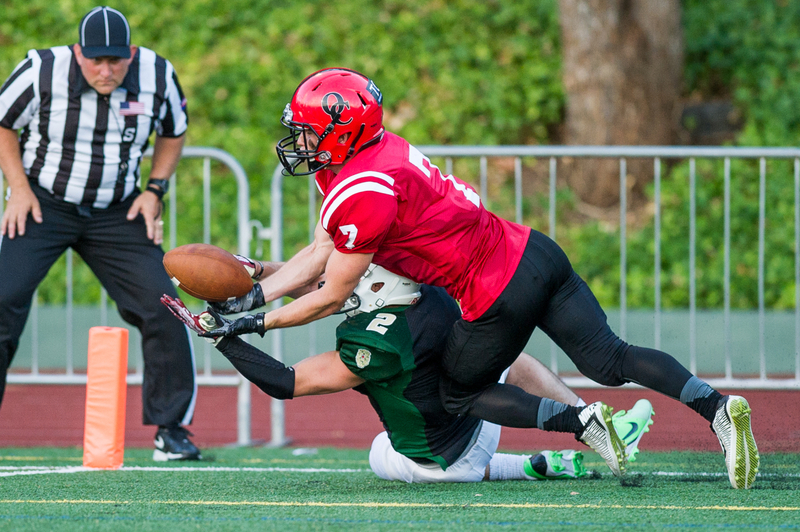 Oregon City defensive back Brody Page (4) breaks up a fourth quarter pass intended for West Linn wide receiver Cody Coppedge (5). 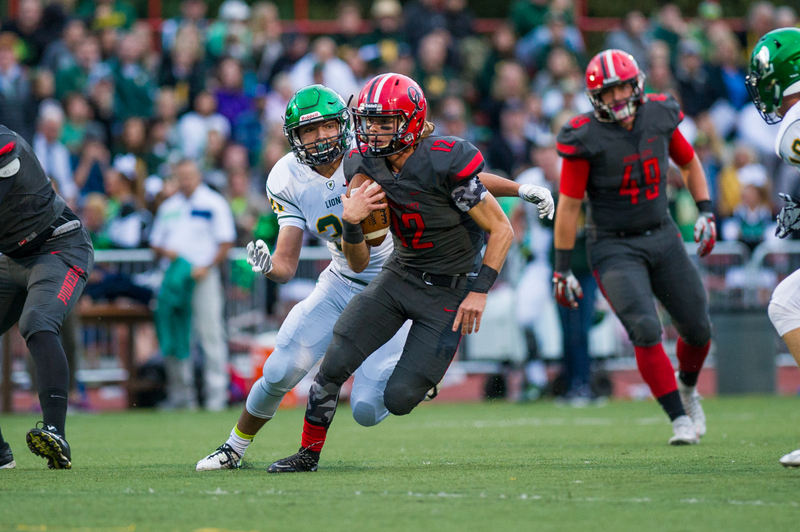 Oregon City quarterback Riley Rexine (12) scrambles out of the pocket during a first quarter drive during the Battle of the Bridge against West Linn. 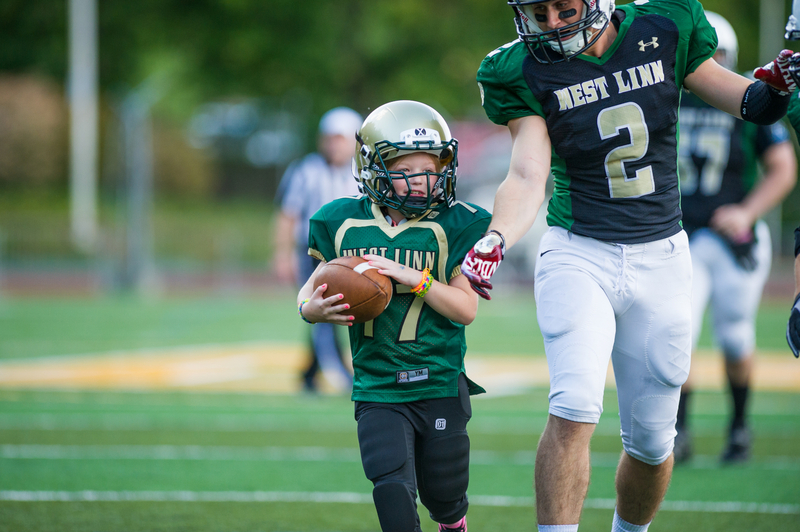 In 2011 West Linn High School alum Ian Giammanco and Trent Tribou come up with an idea to money for the Cystic Fibrosis Foundation as Giammanco's young daughter has CF. 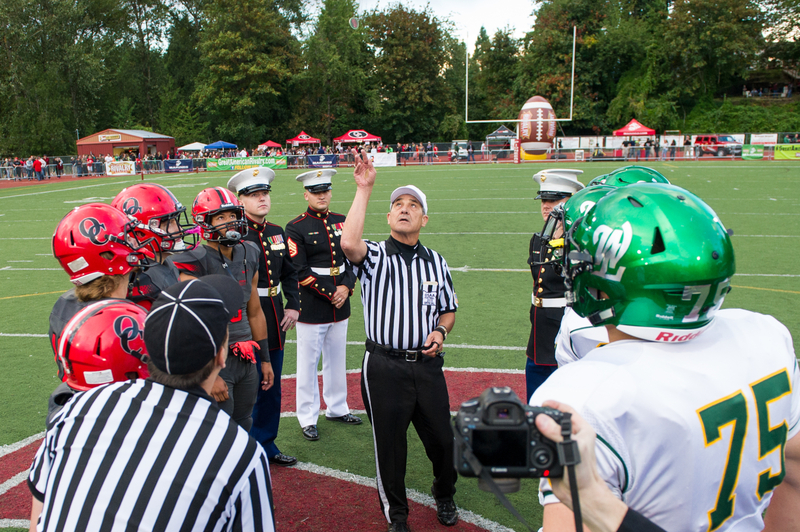 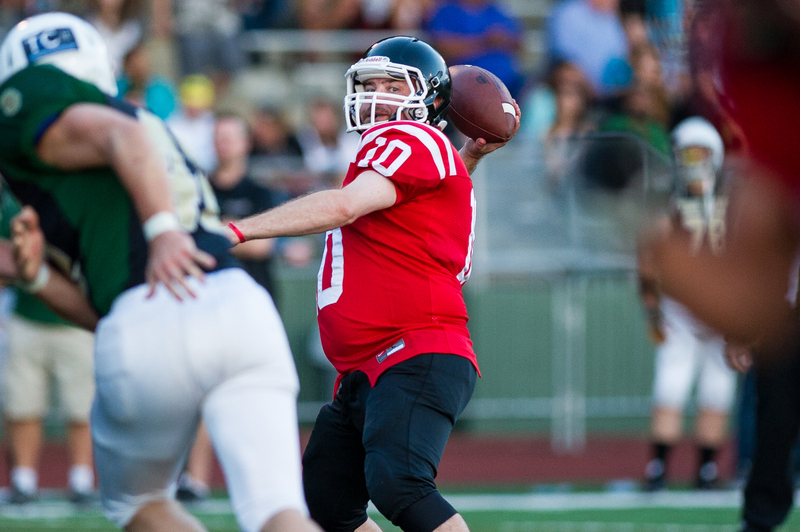 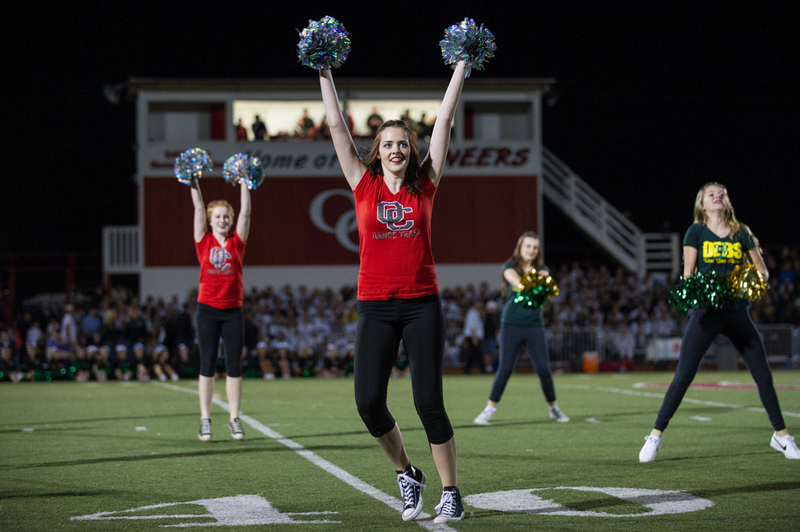 The unique fundraising event was to have alumni of Oregon City and West Linn High Schools play a football game in the spirit of "The Battle for the Bridge," an annual match-up between the two neighboring schools that is themed the longest running rivalry game west of the Mississippi. 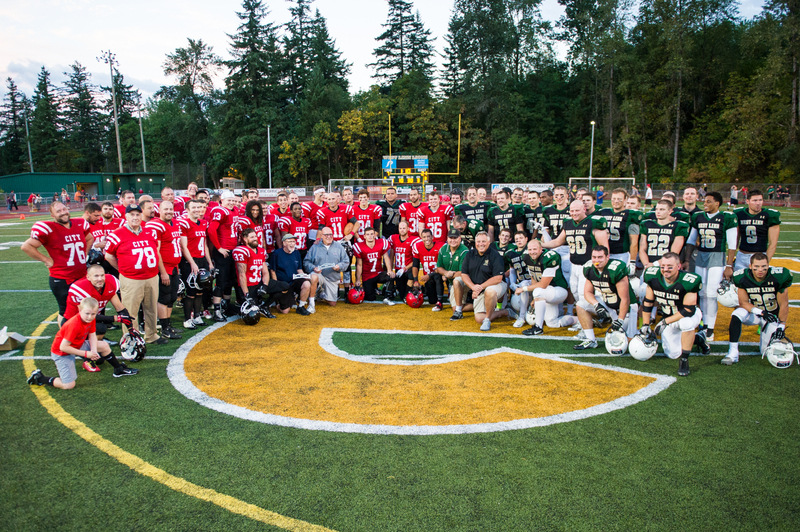 Participating players are primarily in the 20's and 30's, but there are some aging souls in the 40's giving all they have in honor of their school, community and giving to support the fight against CF. 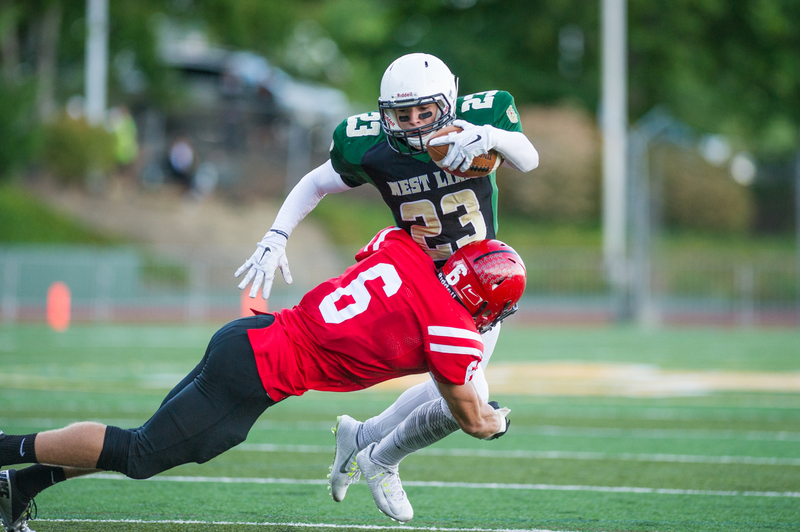 This year's game was held at West Linn High School with the Oregon City Pioneers scored a 48-28 victory over the Lions but the true winner was the Cystic Fibrosis Foundation with over $25,000 raised this year and over $100,000 raised over the five year history of the game. 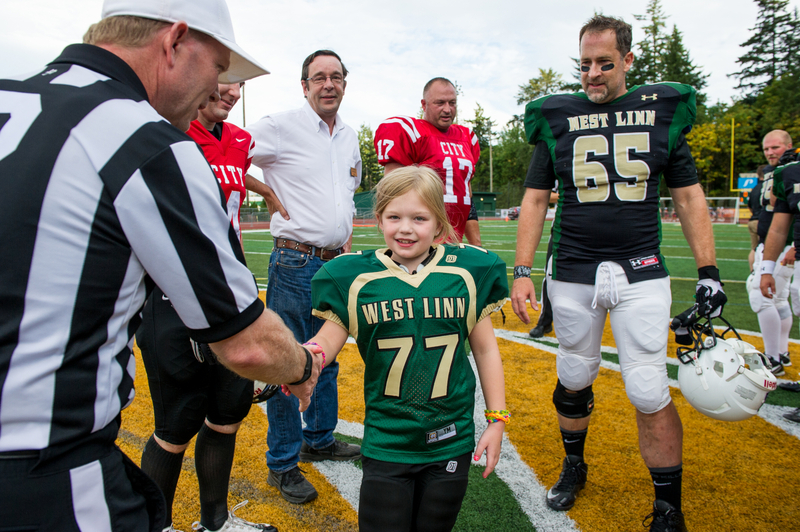 Honorary captain Sophia Giammanco (77) shakes hands with a referee during the coin toss ceremony to begin the Battle of the Bridge with West Linn captain Mike Livermore (65) looking on. 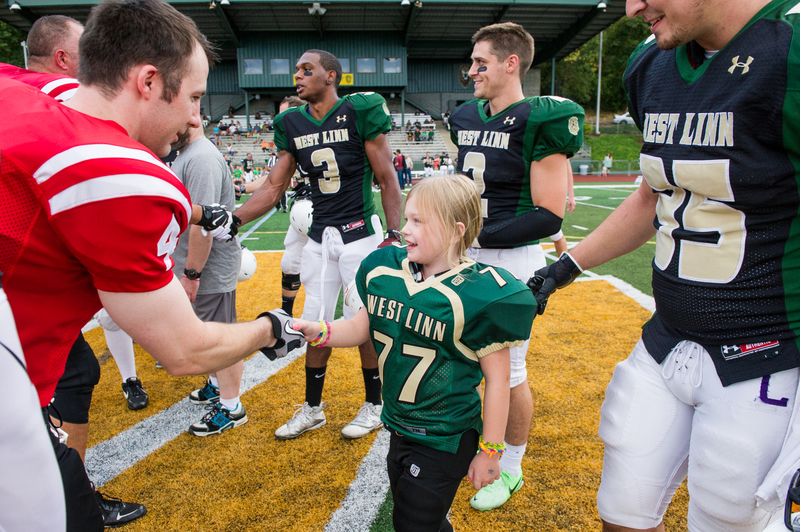 Honorary captain Sophia Giammanco (77) shakes hands with Oregon City captain Joe Wolf (4) during the coin toss ceremony to begin the Battle of the Bridge with West Linn captain Mike Livermore (65) looking on. 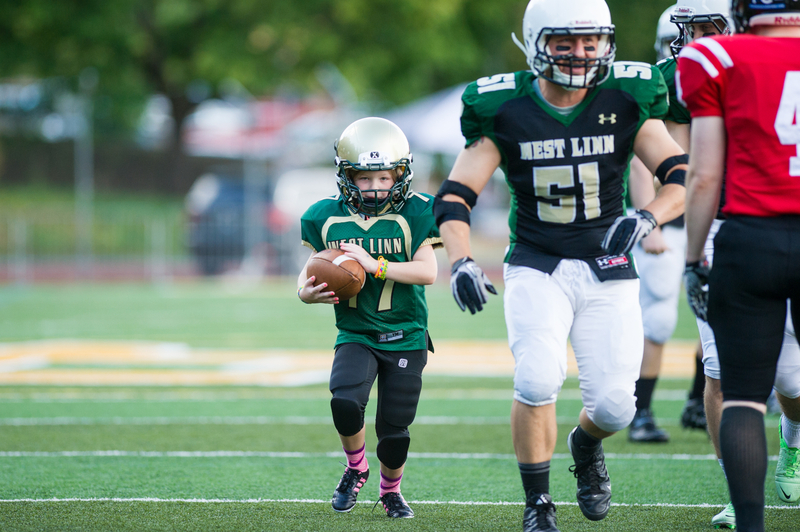 Honorary Battle of the Bridge captain Sophia Giammanco (77) runs for a touchdown during a special play during the opening of the fifth annual alumni football game between West Linn and Oregon City High Schools. 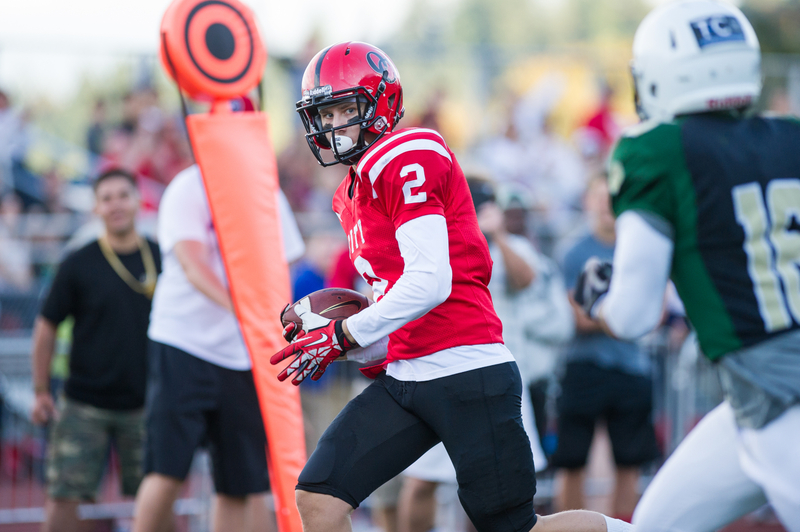 Oregon City wide receiver Tristan Birge runs to West Linn 20 yard line at the tail end of a 60 yard pass reception on the opening play of the first quarter for the Pioneers. 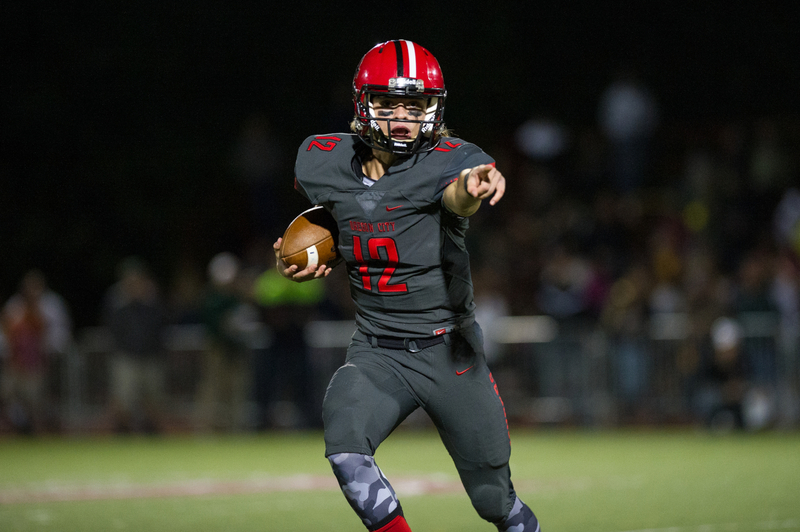 Oregon City quarterback Russ Schneider throws to wide receiver Scott Lloyd for a 20 yard touchdown to open the scoring at 10:57 left in the first quarter. 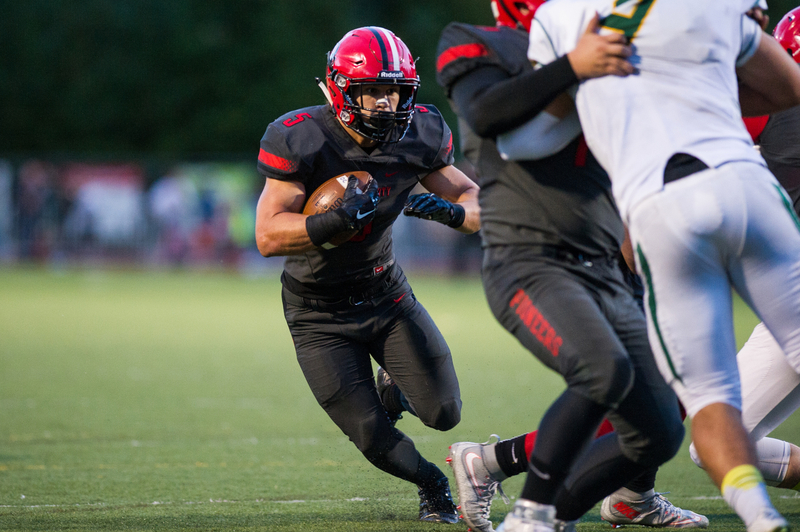 Oregon City wide receiver Scott Lloyd runs into the endzone to score the opening touchdown off a 20 yard pass from quarterback Russ Schneider with 10:57 left in the first quarter. 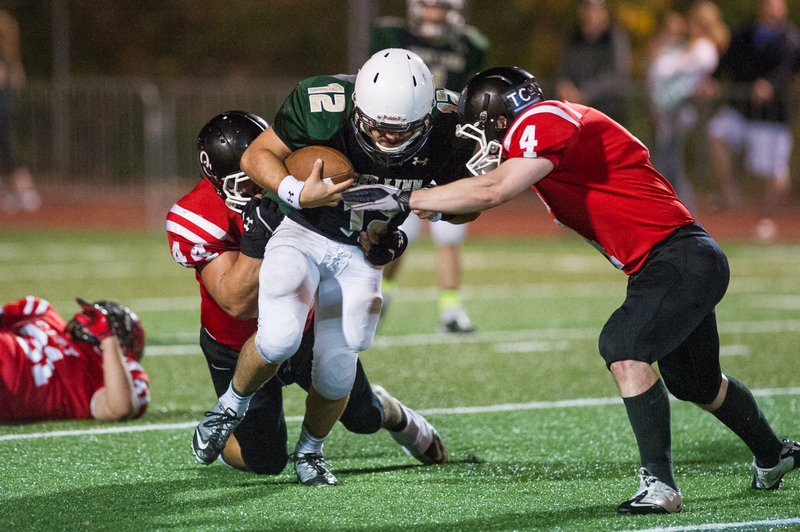 Oregon City defensive back Trevor Dye tackles West Linn running back Joe Rose to hold his run to a one yard gain early in the first quarter. 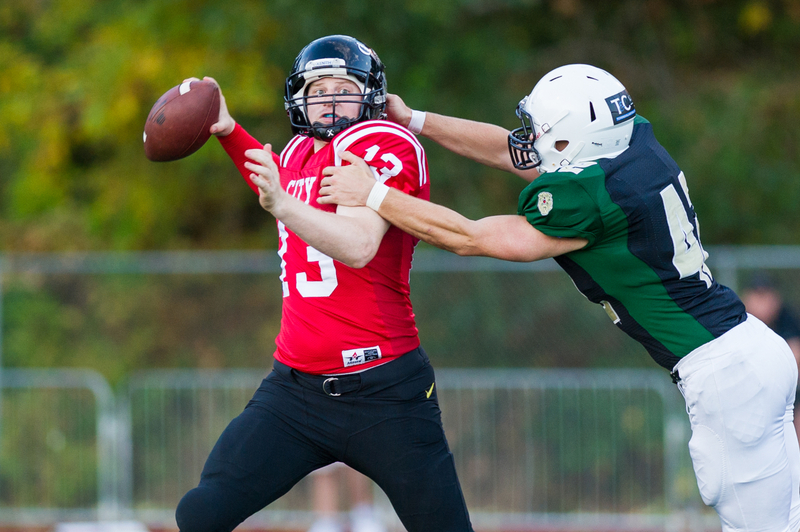 Oregon City quarterback Russ Schneider (13) gets a pass off under pressure from West Linn defensive lineman Taylor Rose during a first quarter drive. 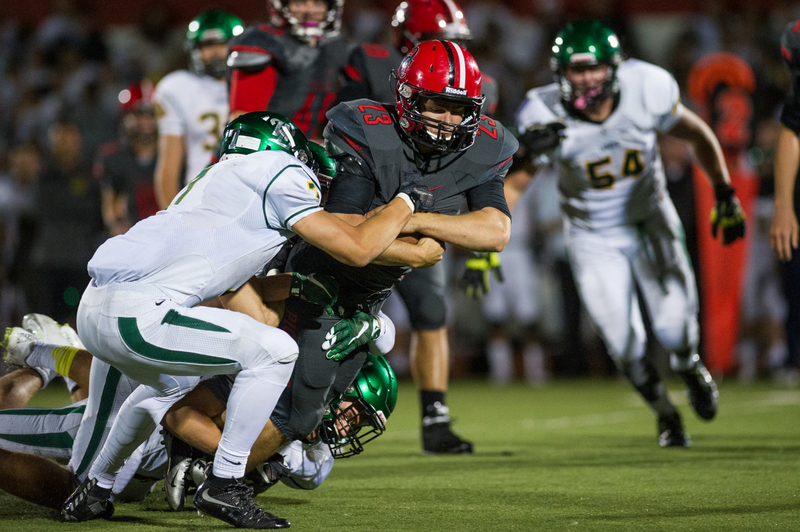 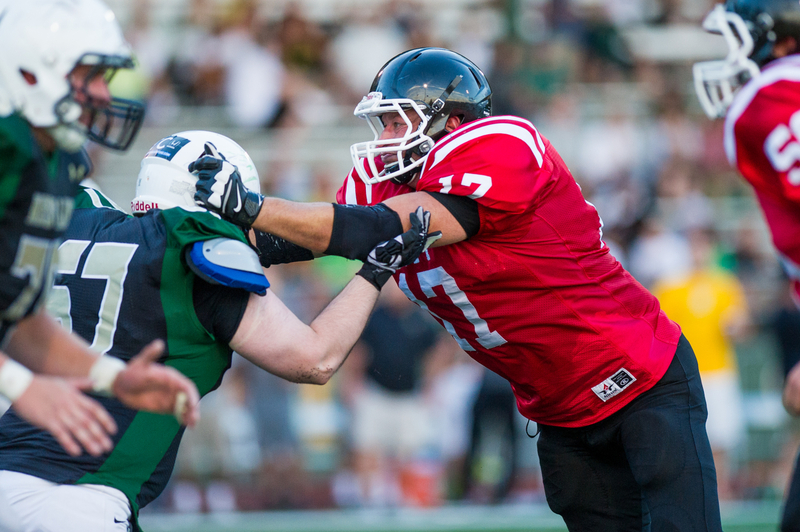 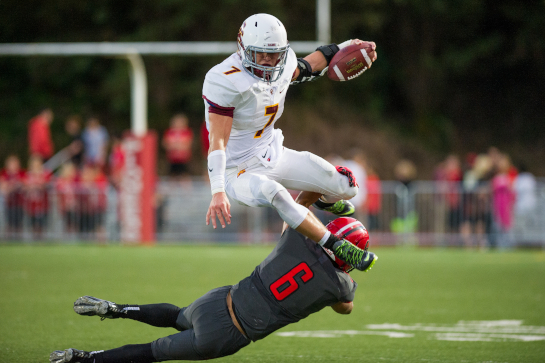 Oregon City defensive lineman Steve Stenger rushes West Linn quarterback Peyton Germain during a first quarter drive. 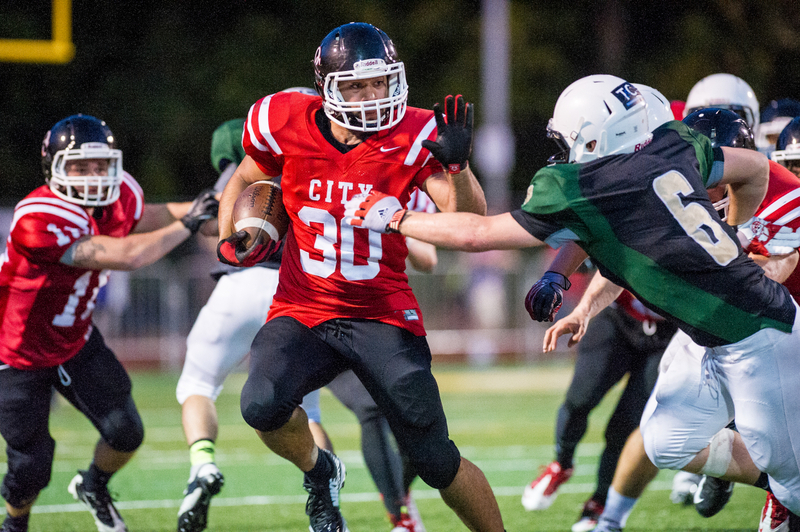 Oregon City defensive lineman Steve Stenger catches an unrostered West Linn player in the backfield after a bad snap late in the first quarter. 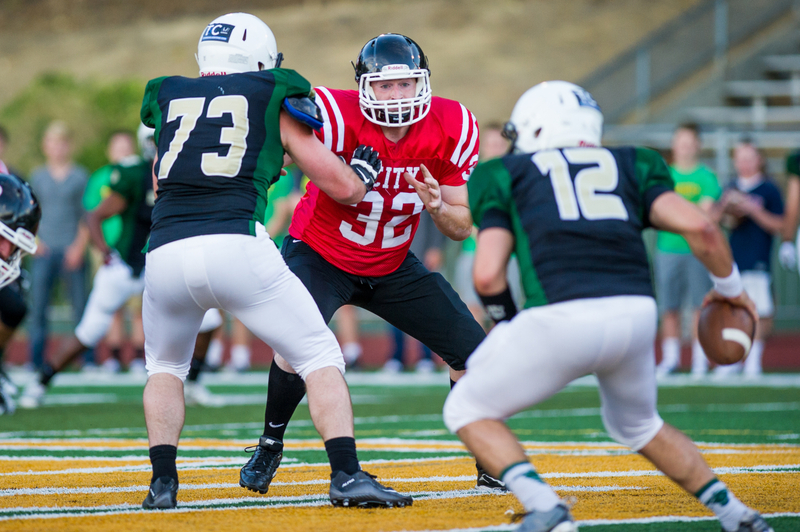 Oregon City linebacker Jerry Stone (44) rushes against the blocking of West Linn offensive lineman Mike Maloney (52) during the second quarter. 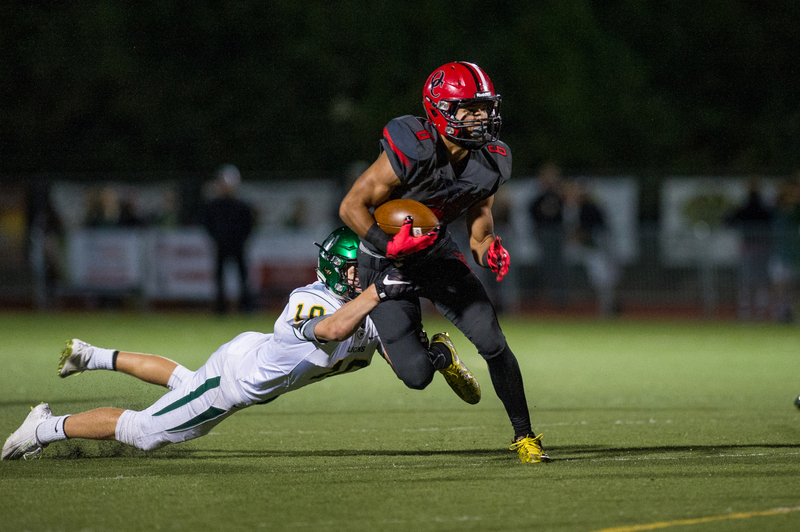 Oregon City defensive back Tristan Birge nearly pulls off a pass interception in the endzone during a second quarter West Linn drive. 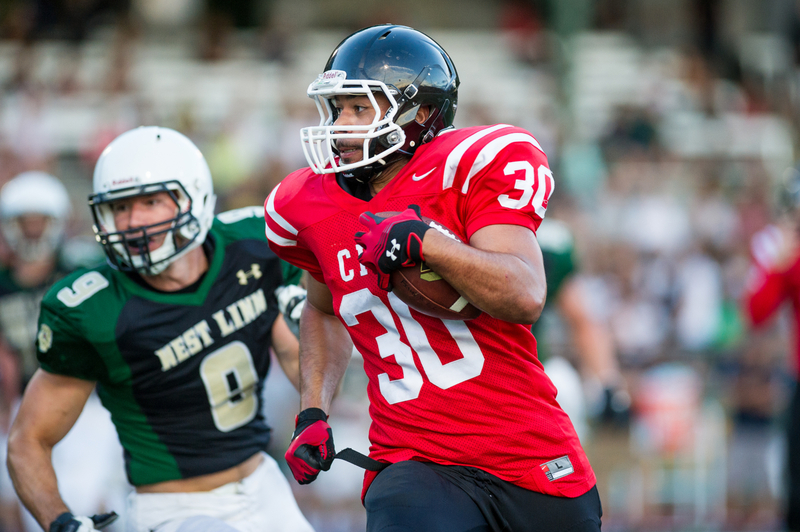 Oregon City running back Malcolm Paulston (30) runs for a 64 yard gain down to the West Linn 13 yard line during a second quarter scoring drive. 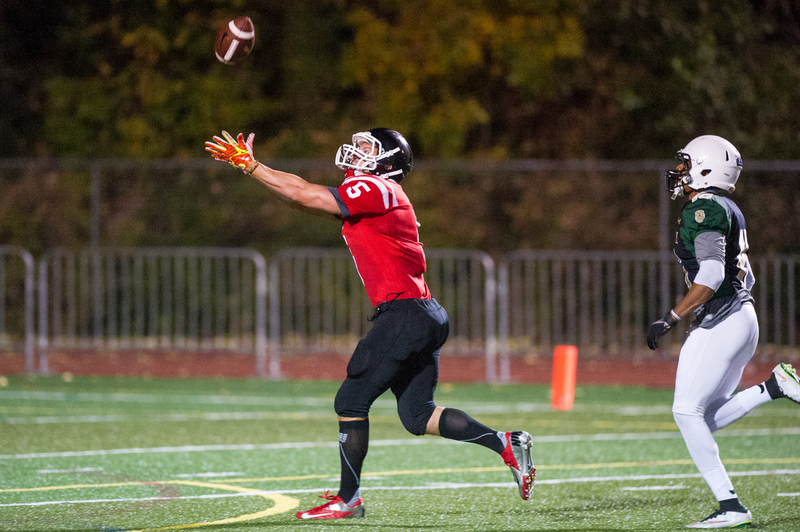 Oregon City quarterback Jeff Hower (10) throws a five yard touchdown pass with 32 second to go in the second quarter. 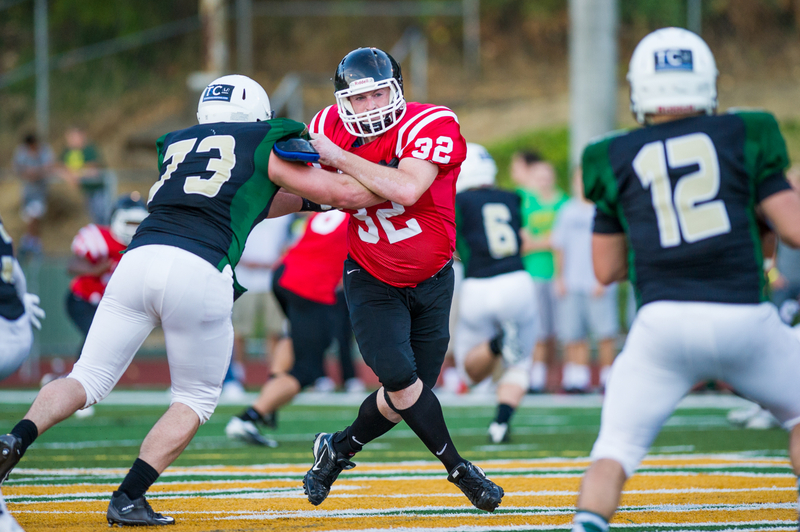 Oregon City defensive tackle rushes against West Linn offensive lineman Jack Cannon during a second quarter Lions drive. 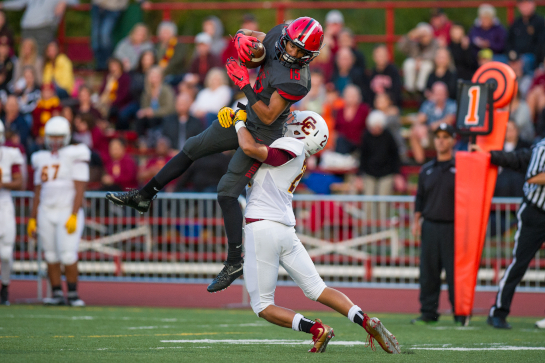 Oregon City defensive back leaps to break up a West Linne pass attempt in the endzone during a second quarter Lions drive. 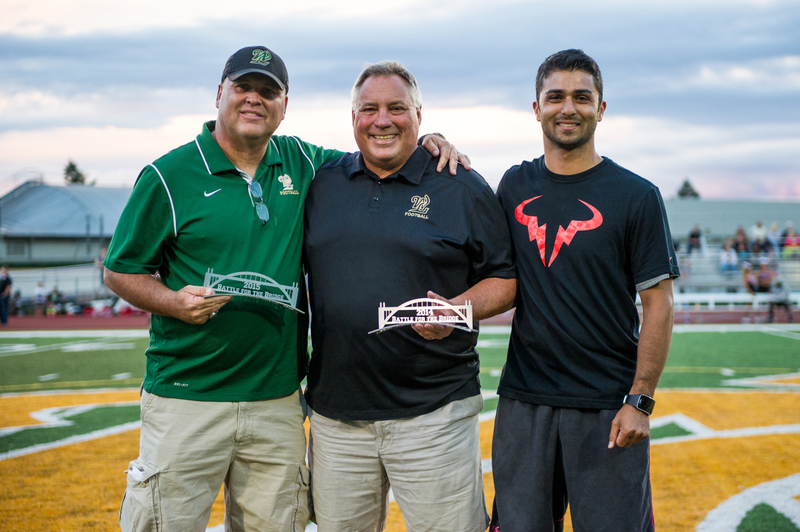 West Linn Battle of the Bridge Hall of Fame inductees Joe Cerny and Ron Chappell with board member Imran Haider. 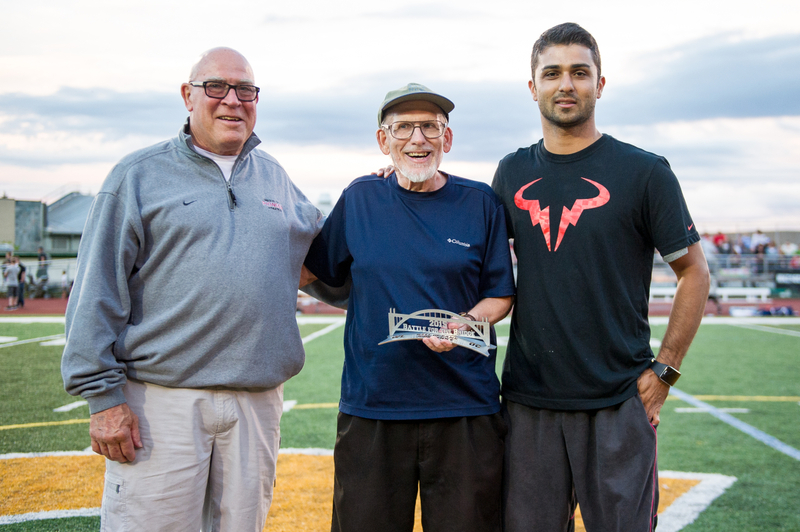 Oregon City Battle of the Bridge Hall of Fame inductees Joe Burton and John Denny with board member Imran Haider. 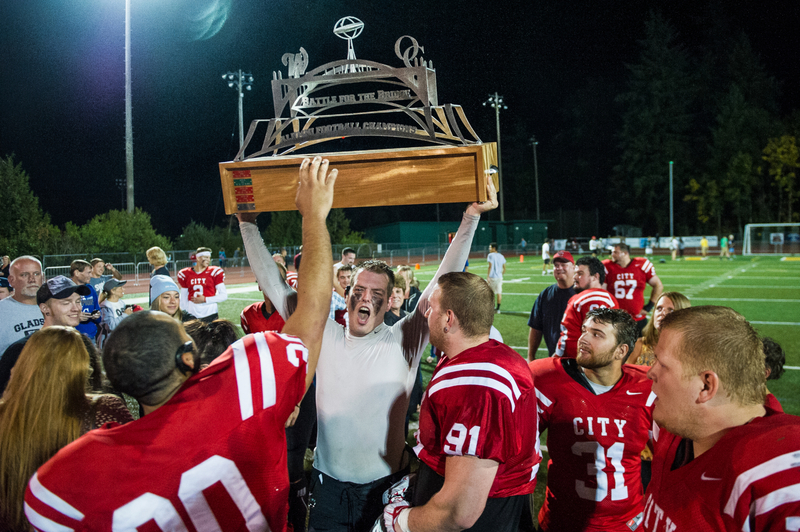 Oregon City and West Linn alumni pose for a photo during halftime of the 2015 Battle of the Bridge. 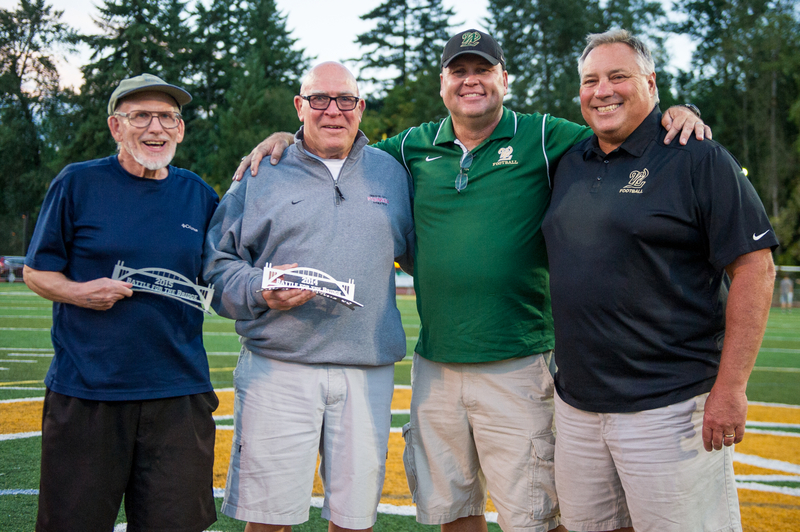 Bridge Hall of Fame inductees John Denny, Joe Burton and Joe Cerny and Ron Chappell. 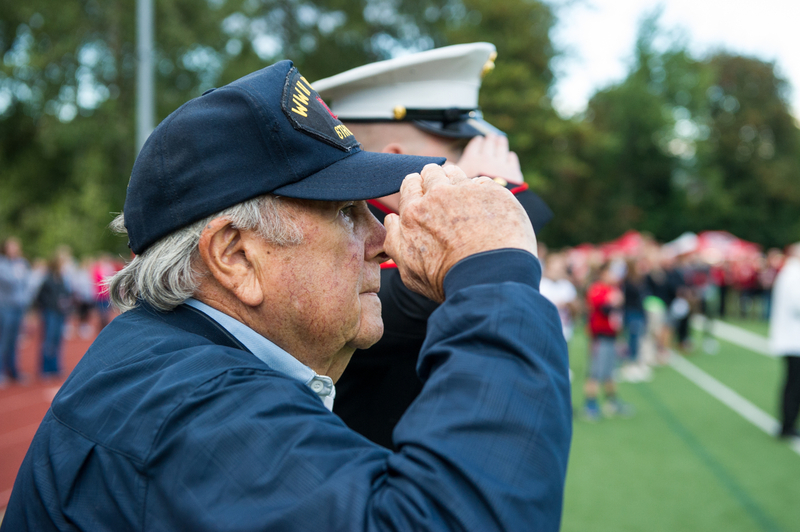 Oregon City 1956 graduate Bob Mahoney takes a snap during a special play to kick of the second half of the 2015 Battle of the Bridge. 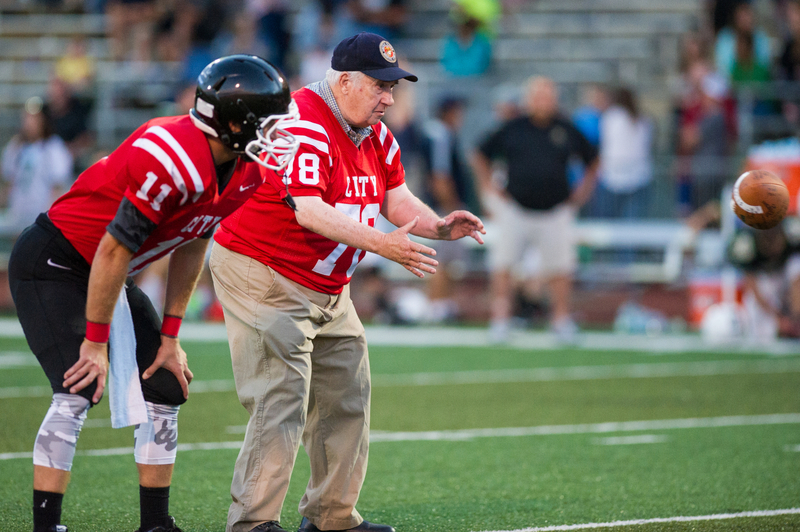 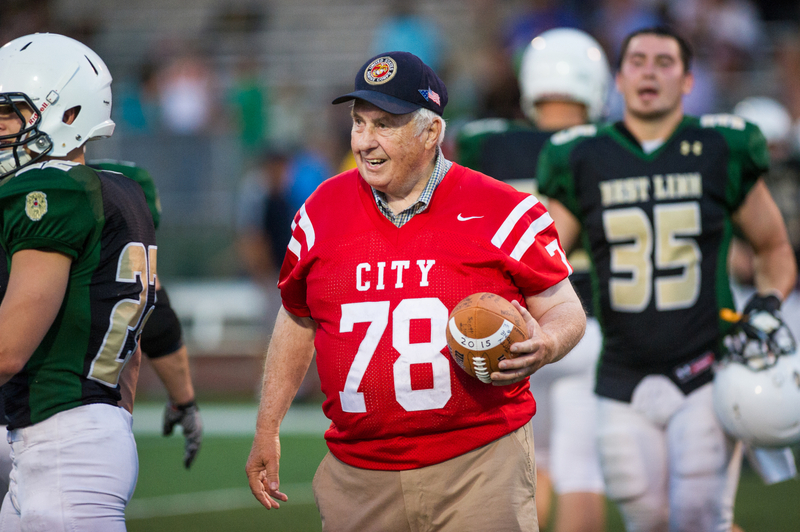 Oregon City 1956 graduate Bob Mahoney walks off the field after taking a snap during a special play to kick of the second half of the 2015 Battle of the Bridge. 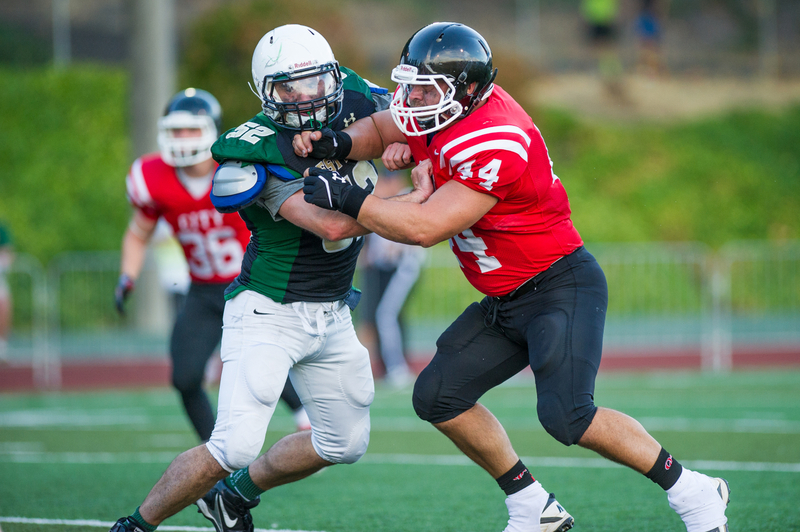 Oregon City defensive tackle Jerry Stone (44) tackles West Linn running back Joe Rose (23) during a Lions third quarter drive. 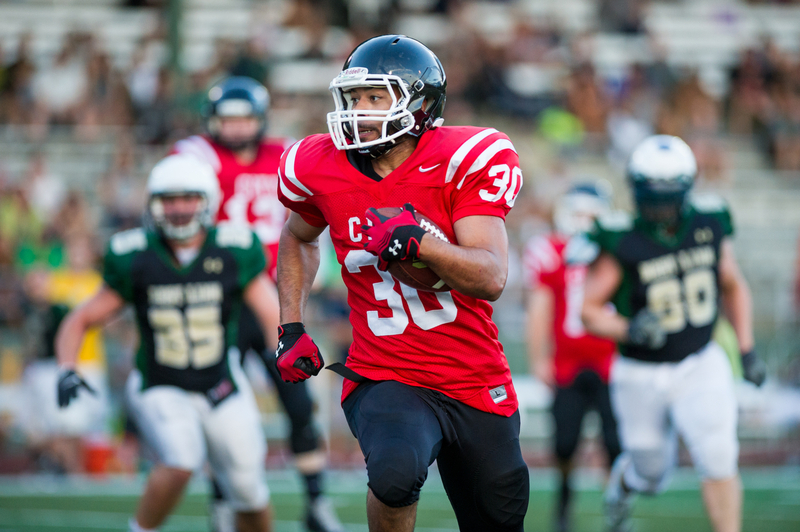 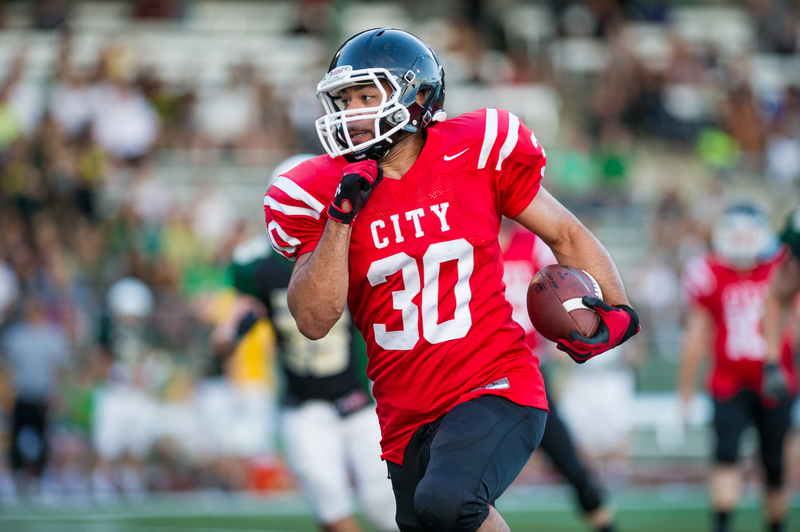 Oregon City running back Malcolm Paulston (30) runs for a 85 yard kickoff return touchdown with 6:08 left in the third quarter. 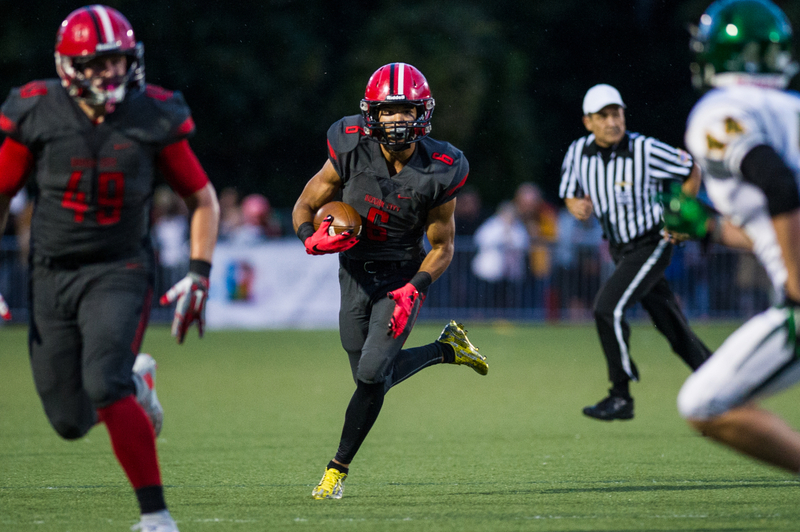 Oregon City wide receiver Ryan Wells (5) pulls in a 56 yard pass completion for a touchdown with 10:36 to go in the fourth quarter. 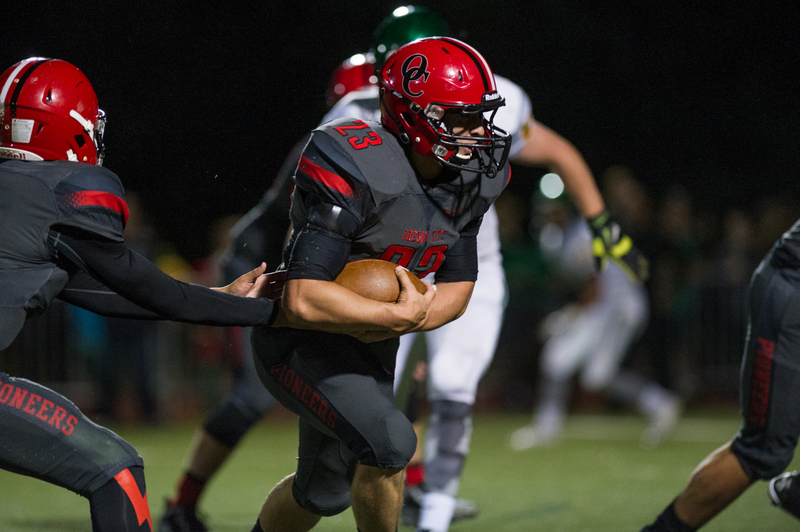 Oregon City defensive lineman Quinten Baxter (67) chases down West Linn running back Joe Rose during a fourth quarter Lions drive. 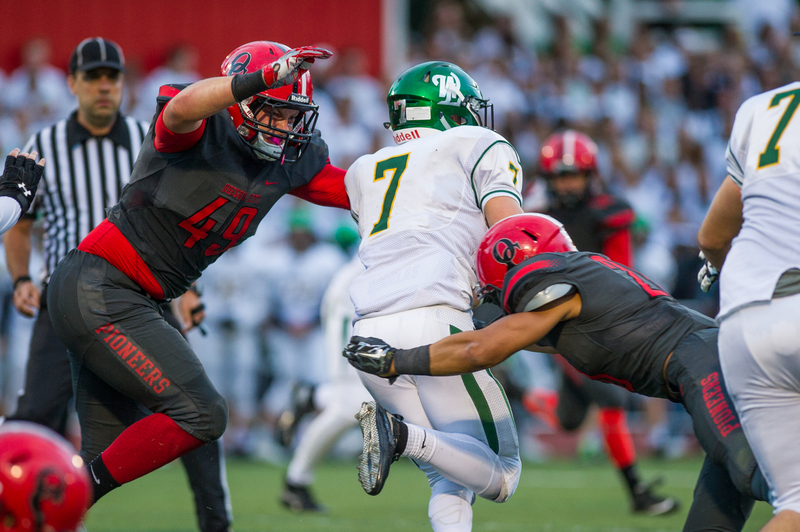 Oregon City defensive tackle Jerry Stone (44) and defensive back Joe Wolf (4) sack West Linn quarterback Payton Germain (12) during a fourth quarter Lions drive. 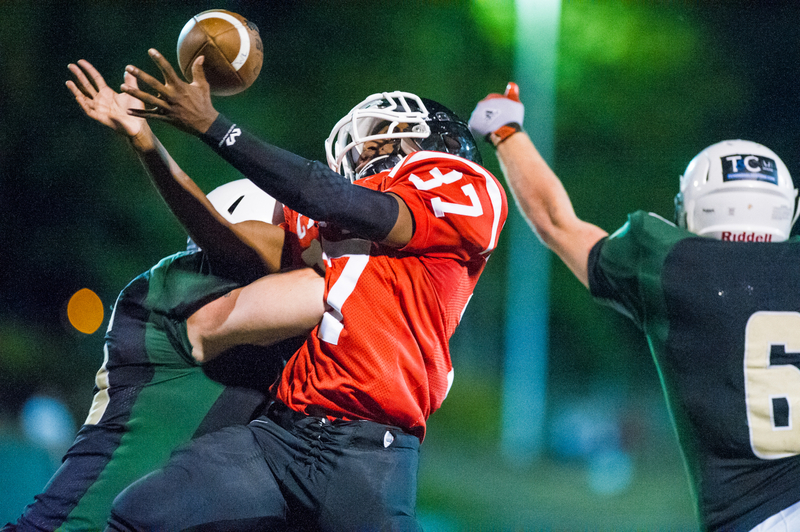 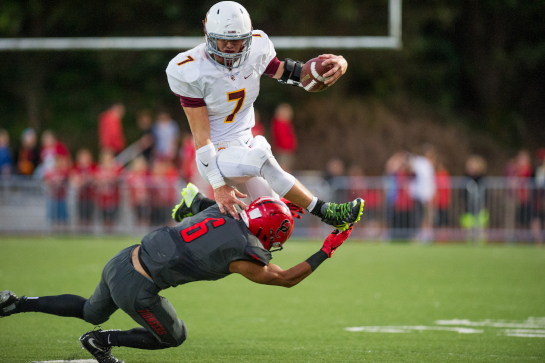 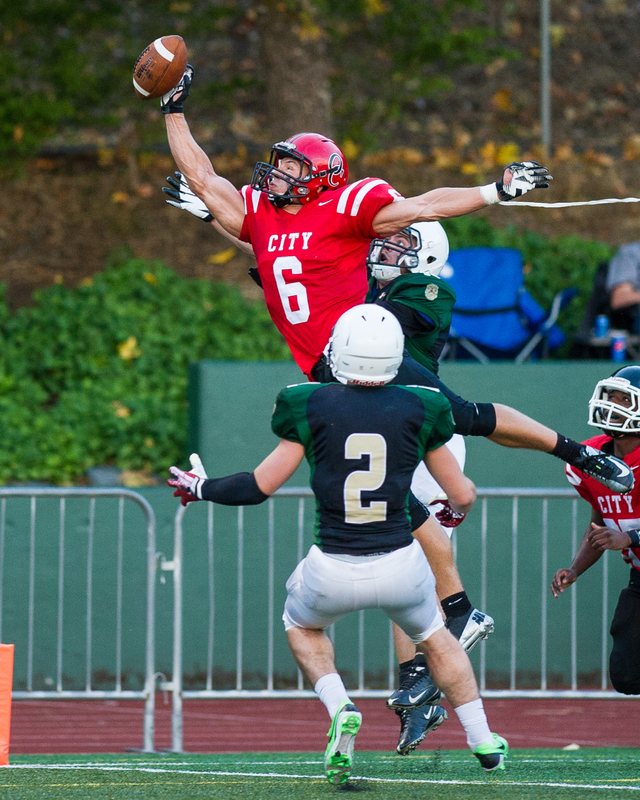 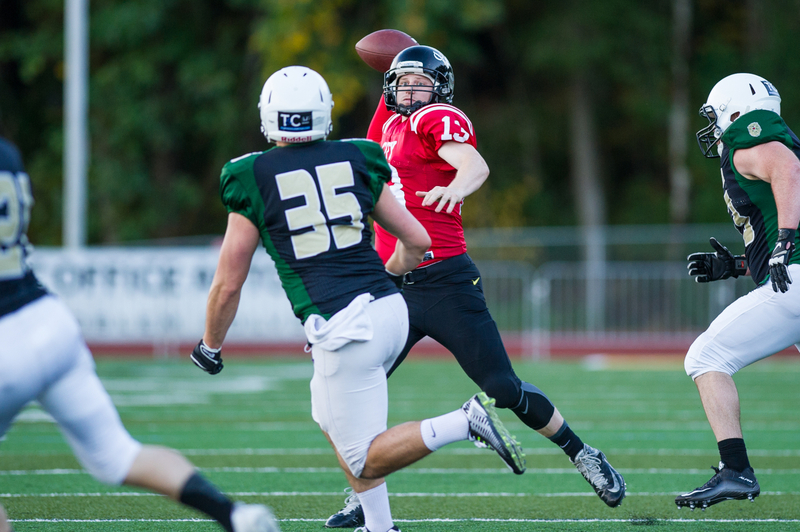 Oregon City defensive back (unrostered) breaks up a pass during a fourth quarter West Linn drive. 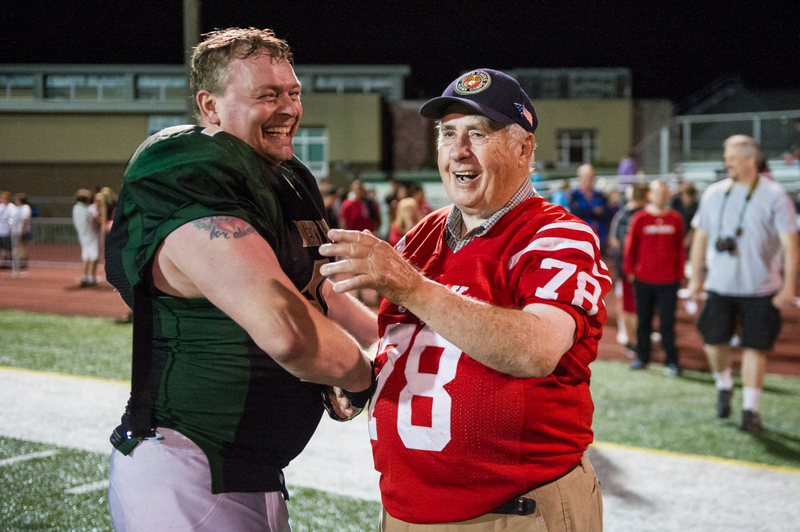 Oregon City 1956 graduate Bob Mahoney shakes hands with West Linn players (#31 not rostered) following the 2015 Battle of the Bridge. 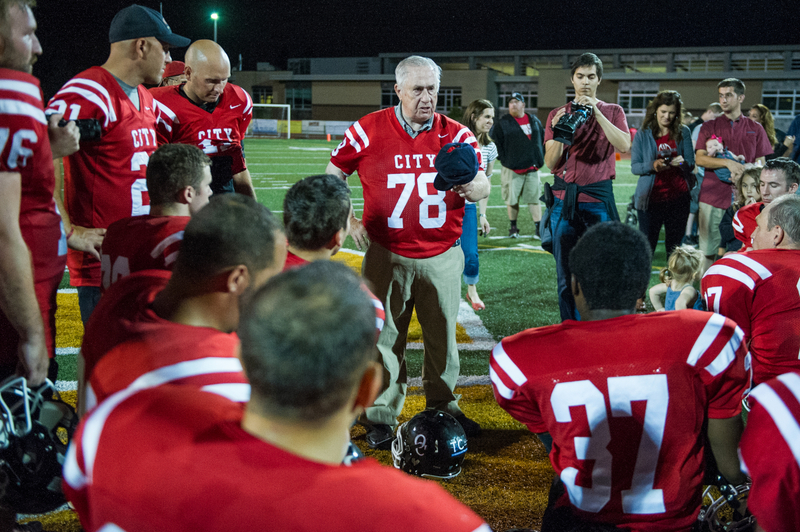 Oregon City 1956 graduate Bob Mahoney speaks to the Pioneer alumni squad following the 2015 Battle of the Bridge.